At last the promise of a fine and sunny day but with strong and cold winds to begin with. 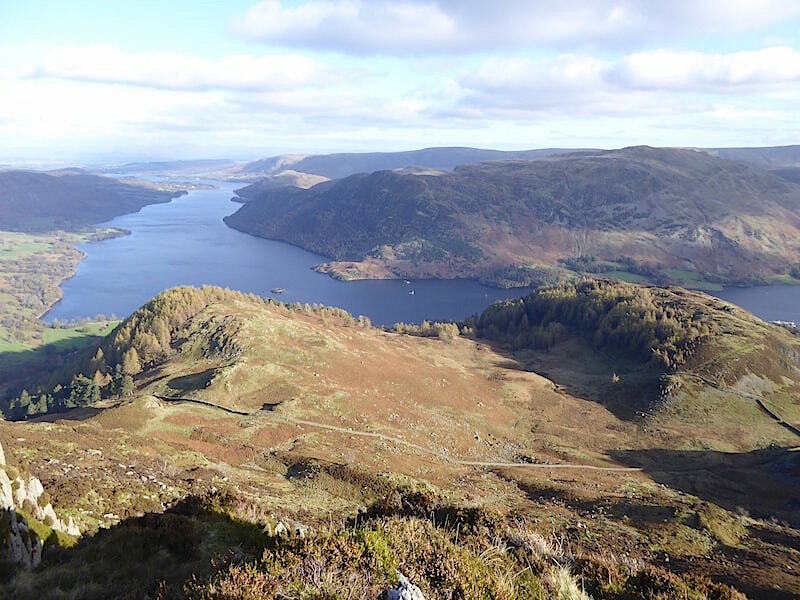 The wind element deters us from going too high so we settle for a tramp over Sheffield Pike and Glenridding Dodd, not excessively high but enough to offer some very good views, which on a good day like today should be more than satisfactory. 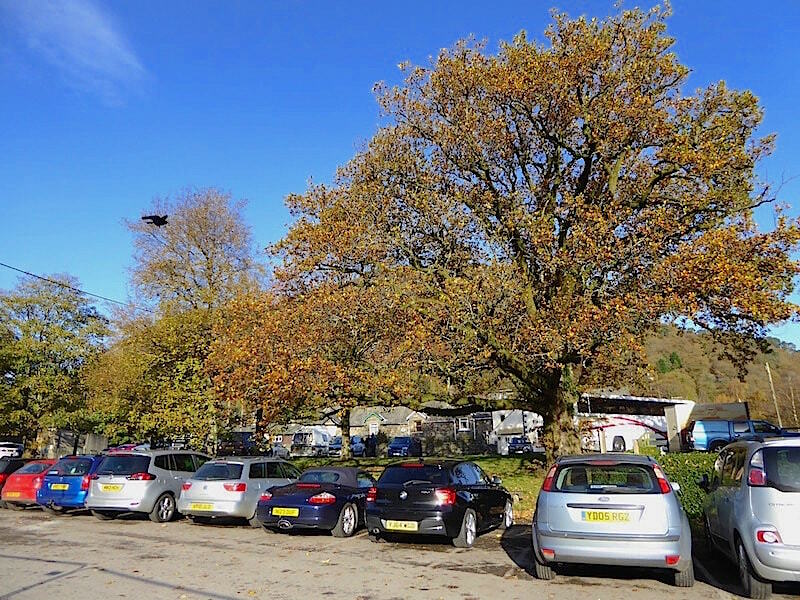 Busy, busy, busy in Glenridding as we walked through the car park and then out onto the Greenside Road. Walkers everywhere, solos, pairs, and groups both large and small, with lots of excited and animated chatter going on. We had parked on the slip road beside the village green where the two occupants of the car we had pulled up behind were just getting kitted up. 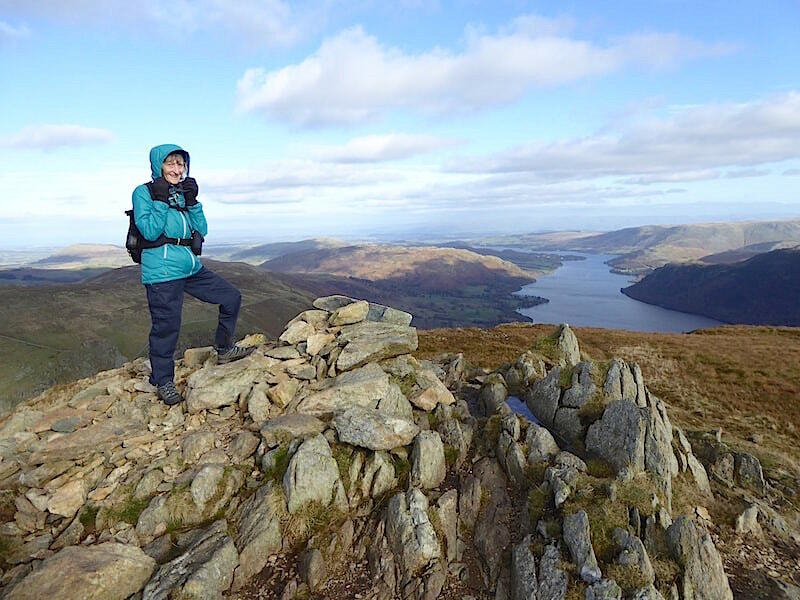 We had a little chat with them as we all got ready and we learned that they were heading for Helvellyn via Striding Edge (having ‘done’ Swirral Edge we were informed) and that he was teaching her how to map read. She had the map open and was attempting to decide in which direction they needed to point themselves when the chap pointed out that it would be easier to read if she hadn’t got it upside down. He turned it the right way up, folded it up a bit smaller so that it was easier to handle and then the lesson was ready to begin. 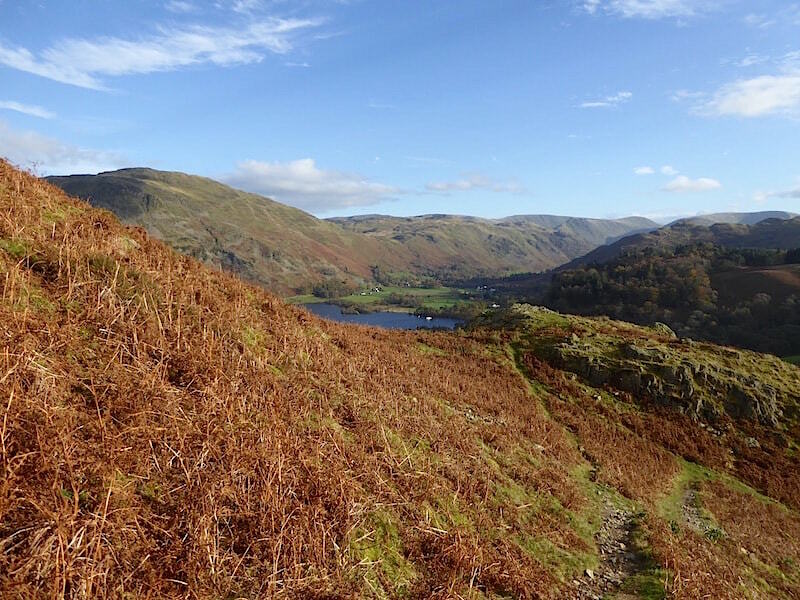 We made our goodbyes and wished them well and I couldn’t help thinking that there would be no need for a detailed study of the map up to Helvellyn today, you’d just have follow the crowds of people heading for it. 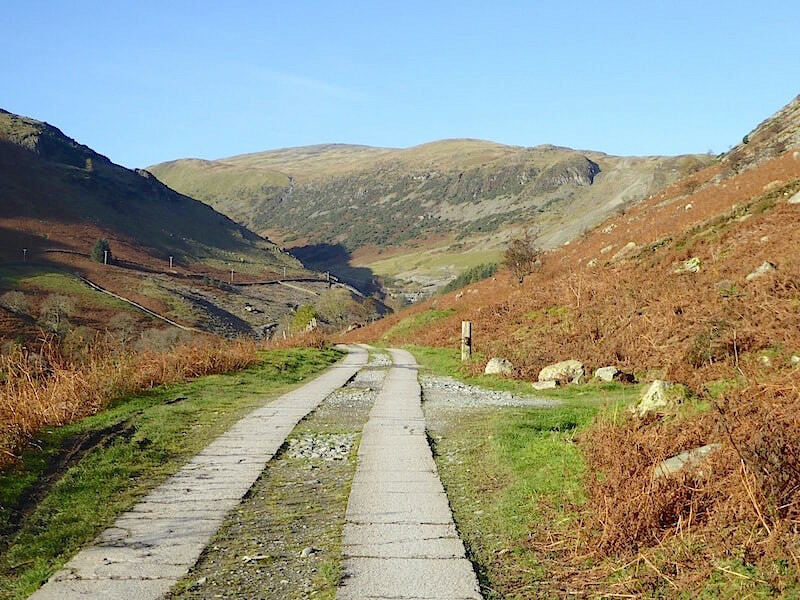 We walk up the Greenside Road out of the village towards The Travellers Rest with only a few other walkers spread out ahead of us so it seemed as though most folk had opted for another of the many routes up to Helvellyn from Glenridding. 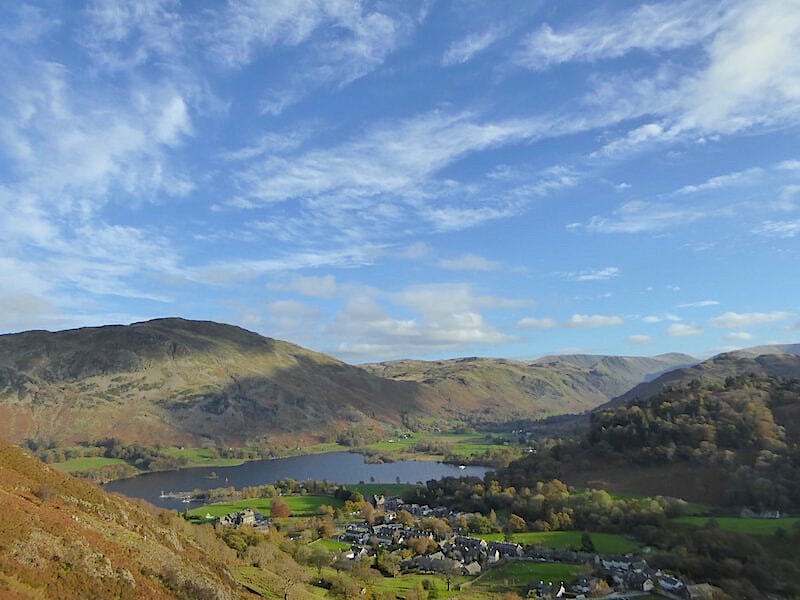 Over on our right Heron Pike and Glenridding Dodd are positively glowing in the dazzling morning sunlight. Its rather chilly as we walk up in the shade of the houses alongside the road though. 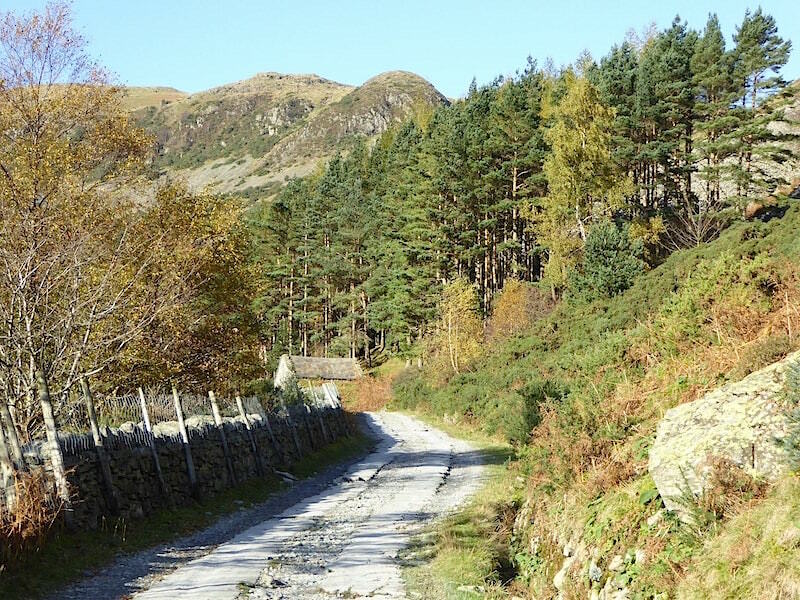 Above the village we reach the junction where most of the walkers ahead of us turned down this lane leading to Rattlebeck Bridge to pick up the Mires Beck route via Birkhouse Moor, in the centre of the photo, up to Helvellyn. 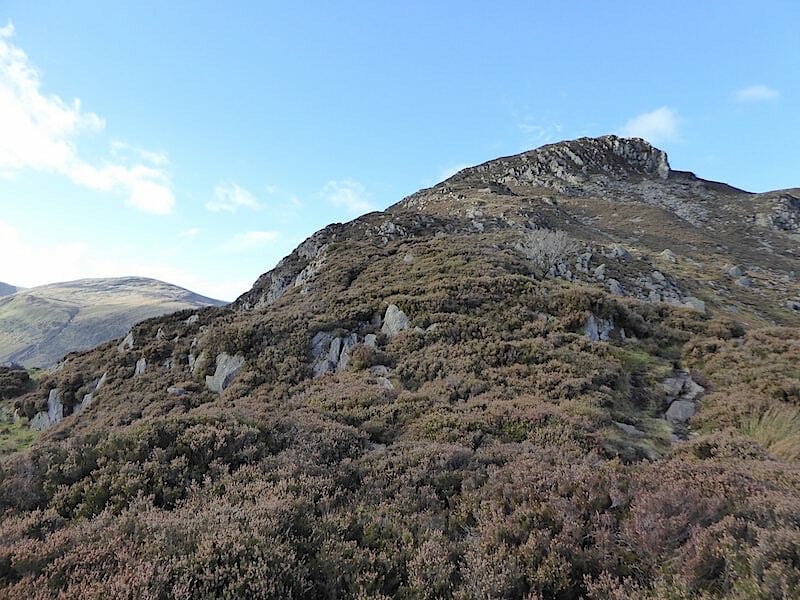 We continue up the hill heading for the Greenside Road where, as we were now in full sun and starting to warm up, a stop to remove my jacket was required. 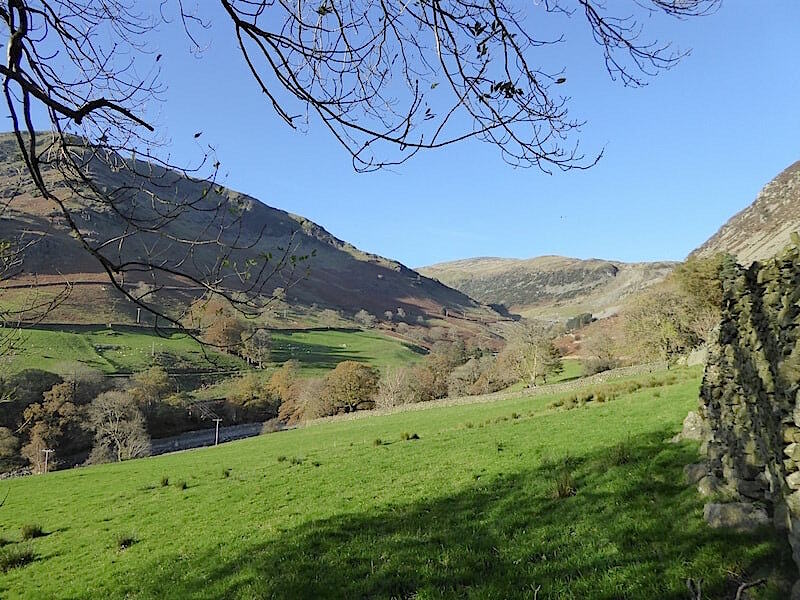 An opportunity to take a look along the valley at Raise and Stang End on the skyline ahead. 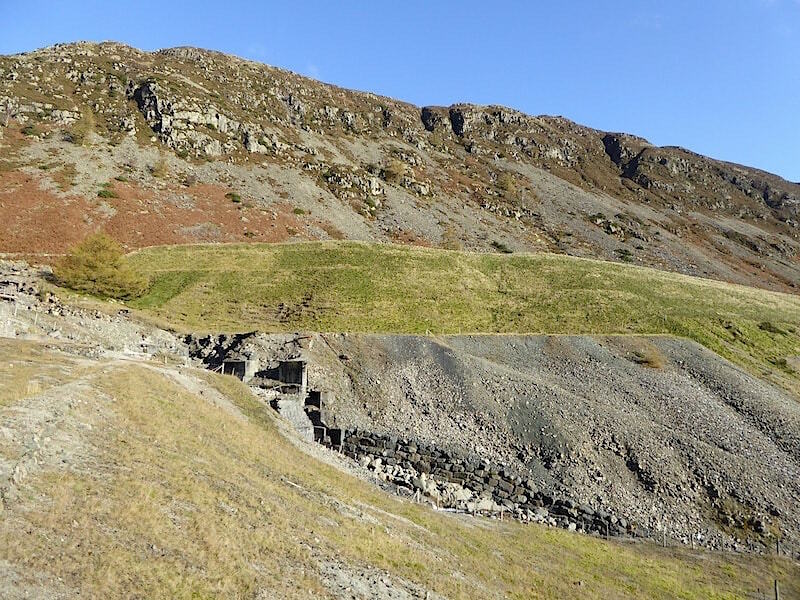 Dry walking on a concrete surface as we head up to the old Greenside Mine, bliss! A little way back we had been overtaken by a young couple who were charging ahead at some speed, only for us to overtake them when they stopped suddenly, consulted their map and had a bit of a confab. They must have turned back because they didn’t come past us again and we weren’t exactly rushing. 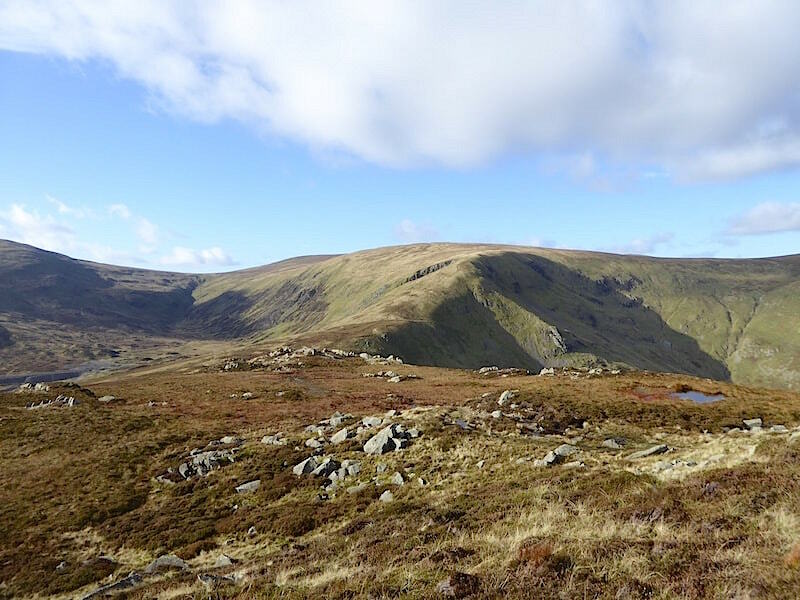 We came to the conclusion that Helvellyn was their target for the day and that somewhere along here they had decided that they had gone astray. 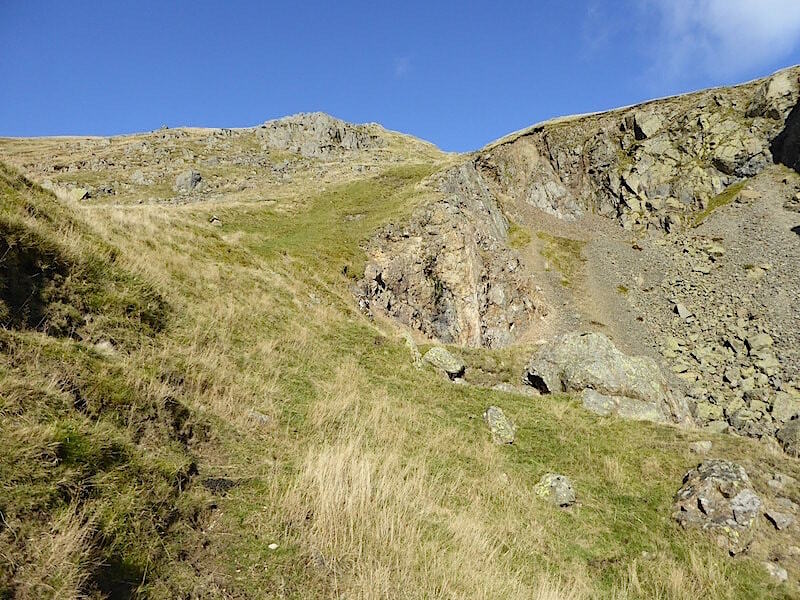 Even if they had they didn’t need to have turned back, you can get to Striding Edge and Helvellyn from this route just as well as any other. 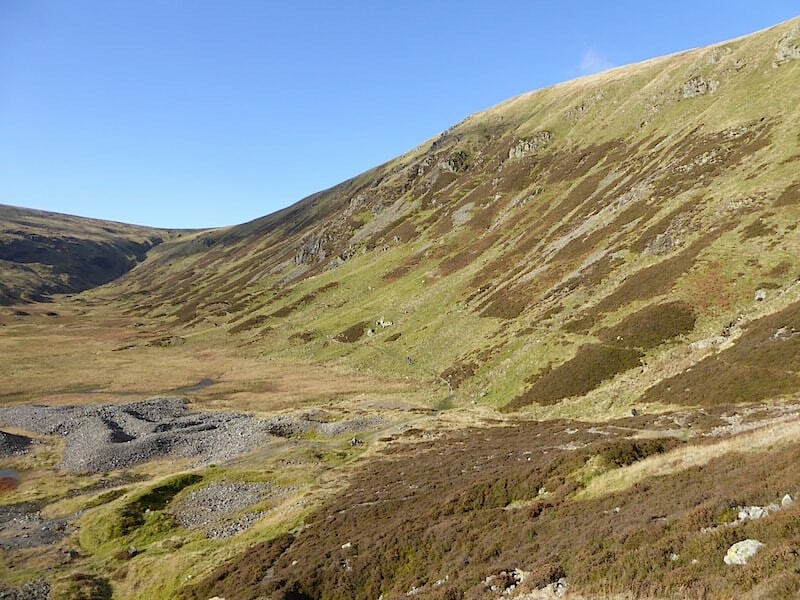 So here we are, still walking up to the mine in splendid solitude, with Stang End and the old explosives store (which it is have thought to been) ahead of us. Crossing the bridge over Swart Beck we take a look up at some of the remains of the mine buildings alongside it. 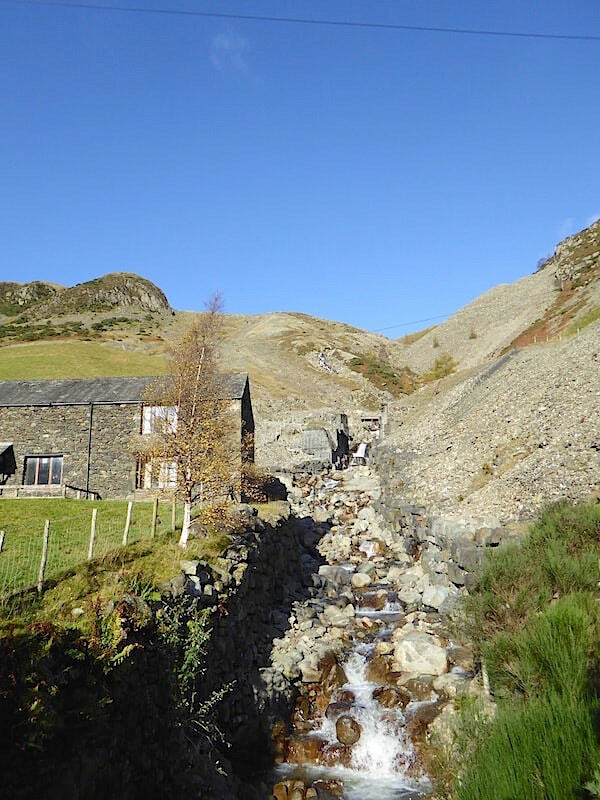 The buildings which weren’t demolished when the mine finally closed have been put to other uses, an outdoor centre and hostel accommodation amongst others. Beyond the buildings we continue up the track with a view of Sheffield Pike beyond the old spoil heaps. At the path junction just beyond the buildings we take a right turn and take the Sticks Pass path which passes below Stang End. 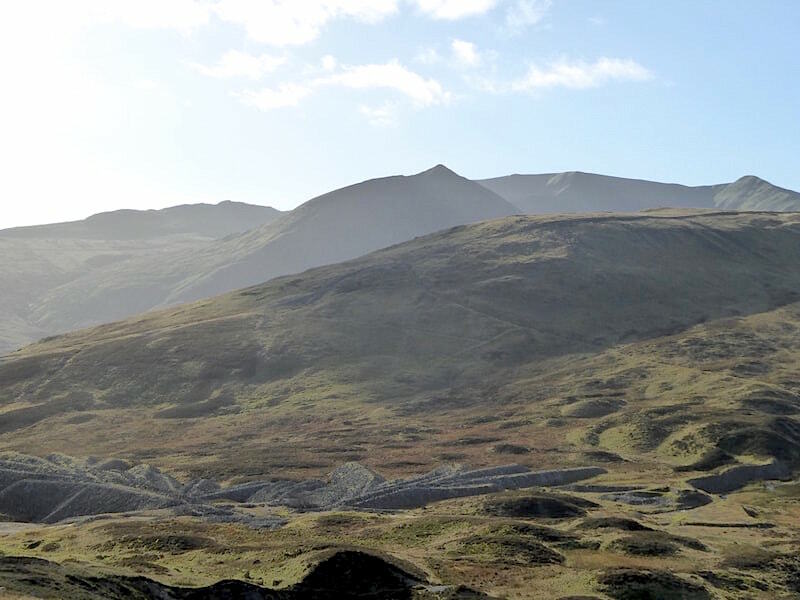 Ahead of us on the skyline is Catstycam with its pointy top, and Helvellyn Lower Man just to the right of it. 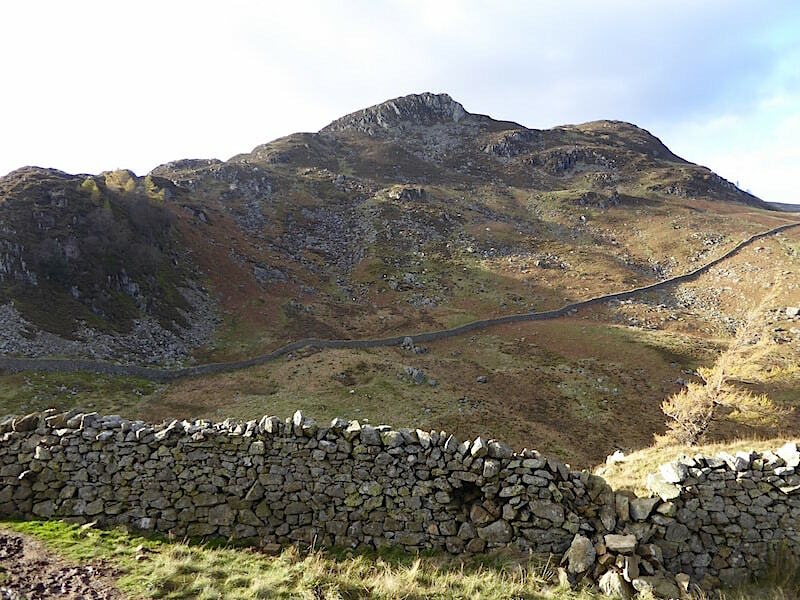 Below us, having just reached the junction, a small band of walkers were trying to decide whether they should follow us up here or keep straight on. There is a sign telling you which path leads where so perhaps they hadn’t noticed it. They eventually decided against coming up here and carried straight on. The stony track gives way to this grassy one for a while, another stop for the removal of my next layer, only a lightweight jumper but it became too warm to walk in now that the sun was directly on our backs and the morning was definitely warming up a bit more. I just cannot walk if I’m sweating buckets and stuffed up with a jacket and jumper. Down to t-shirt level and feeling a whole lot cooler I can crack on much better. 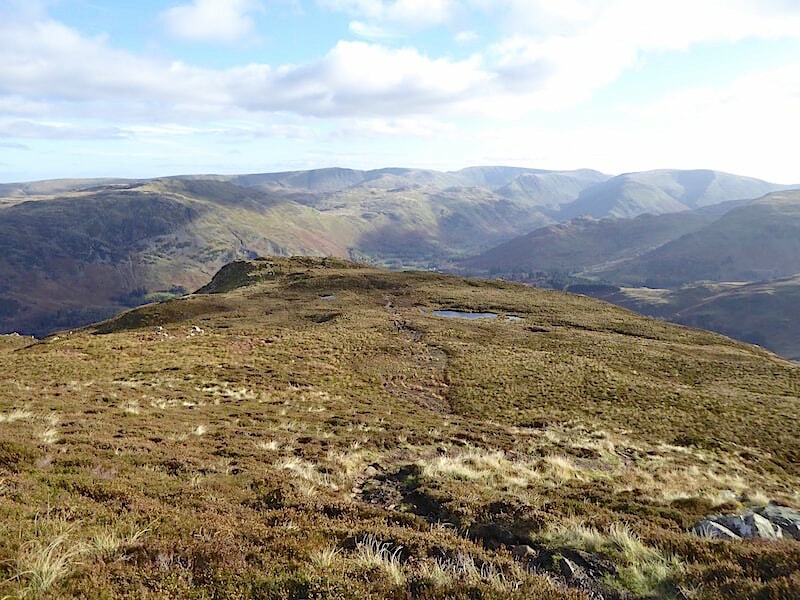 As the de-layering took place we noticed the little band of walkers just mentioned had popped up again below us. They were obviously still unsure about the path they were following and had climbed up the hillside from it to get a better look at their surroundings. Deciding that where we were heading wasn’t where they wanted to go they returned to their original choice of path and that was the last we saw of them. 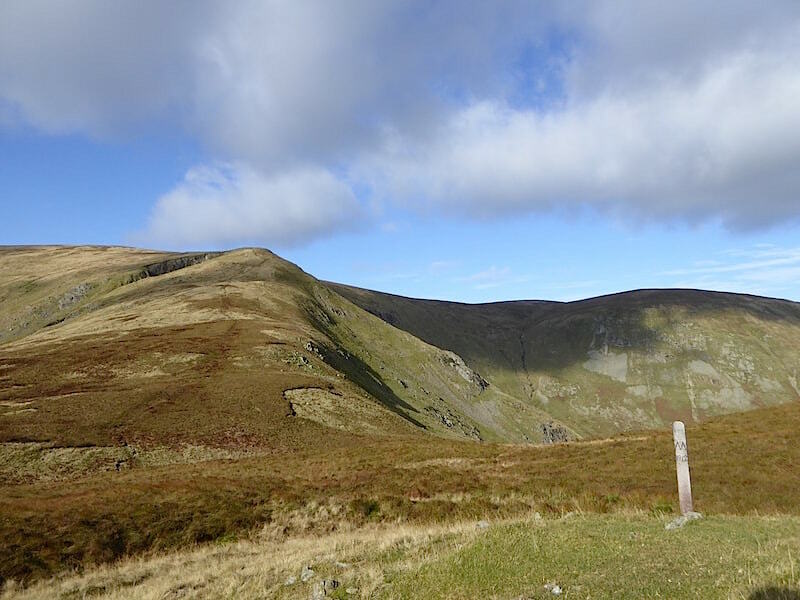 Before I forget to mention it the view is of our route on the Sticks Pass path as it heads up towards Stang End. 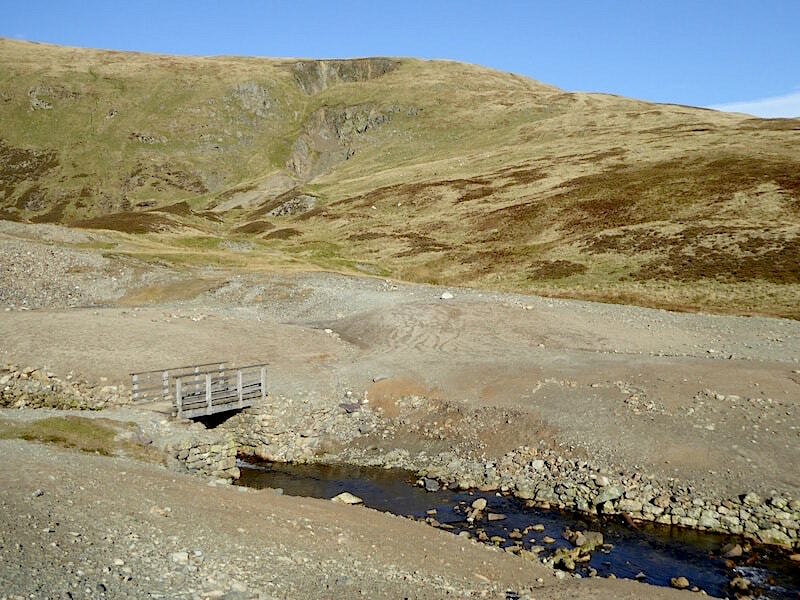 Sheffield Pike above the mine’s water leats as J decides he now needs to divest himself of his jacket, I don’t know he’s managed to get this far in it given that he’s trussed up in it like an oven ready turkey. 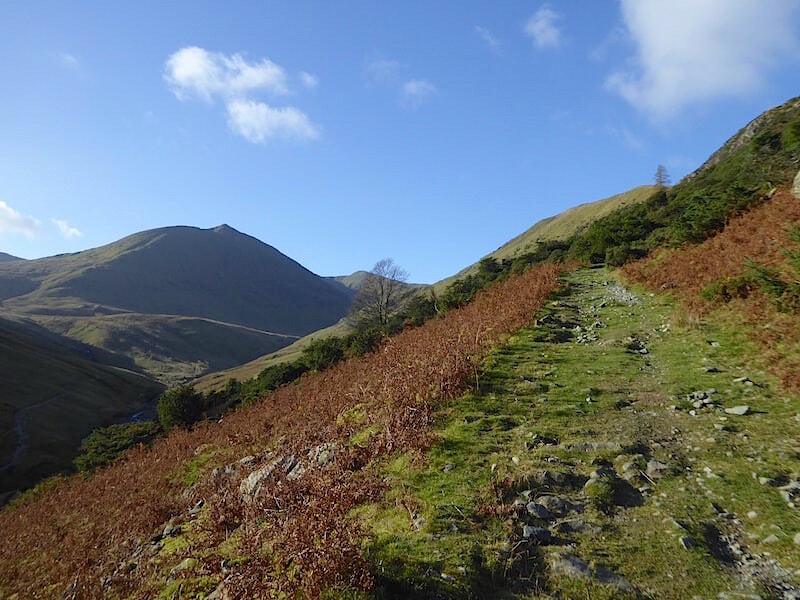 Now that we’re both feeling more comfortable we press on …..
….. up the path which begins to zig-zag as the gradient becomes steeper. 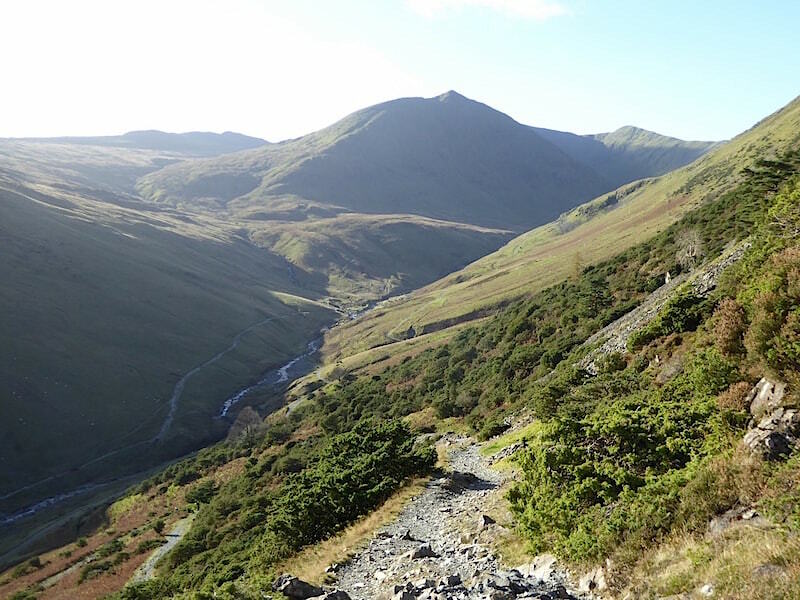 A look straight back down the valley, with Place Fell at the far end, from one of the bends in the path …..
….. and then its on up the now stony path up to the next bend from where we have a view of the path alongside Red Tarn Beck, which the little band of walkers may now be following, and the bulky mass of Catstycam. 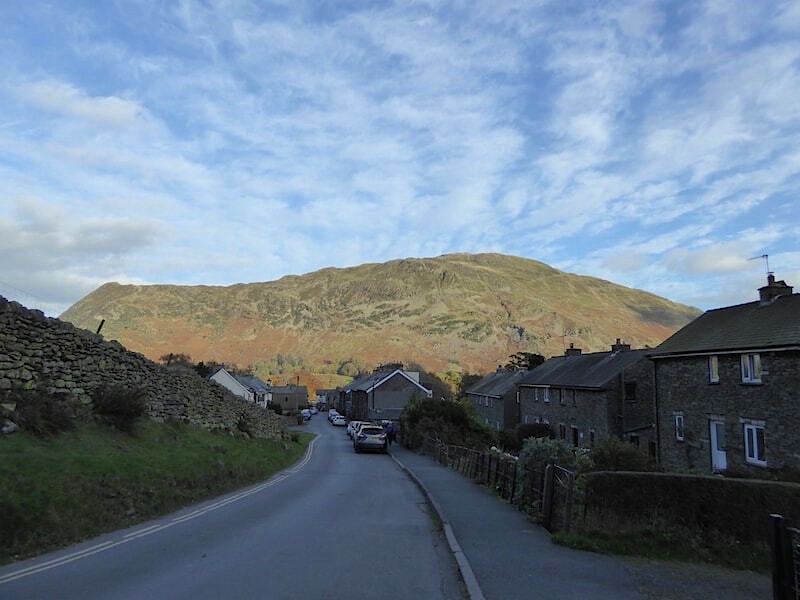 To its right is Helvellyn Lower Man and to its left the Striding Edge route to Helvellyn summit, where I expect those map reading lessons we heard about back down in Glenridding might well be under way. Especially if there’s a long queue to walk across there, you might as well read something while you’re standing in the queue. Passing below Stang End with a lone walker ahead of us, he also came charging by as I was taking photos. Gasping for breath with beads of sweat dropping from forehead, nose and chin he gave the impression of being in some sort of time trial, either that or he needed urgently to find somewhere out of our view for one reason or another. Just beyond Stag End we take the collapsed chimney flue path for a few yards before veering off to the right of it to continue on the Sticks Pass route. The lone walker didn’t turn up here so he probably ended up somewhere in Swart Beck and wondering where the path had disappeared to. We follow the mushy, and for the most part level, path and reach the Swart Beck bridge crossing at the flatter area above the mine. We paused here for a minute or two to slake our thirst and noticed a couple of young lasses, whose voices could be heard very clearly, coming down from Sheffield Pike on the path opposite us. A look over to Sheffield Pike from our stopping point. 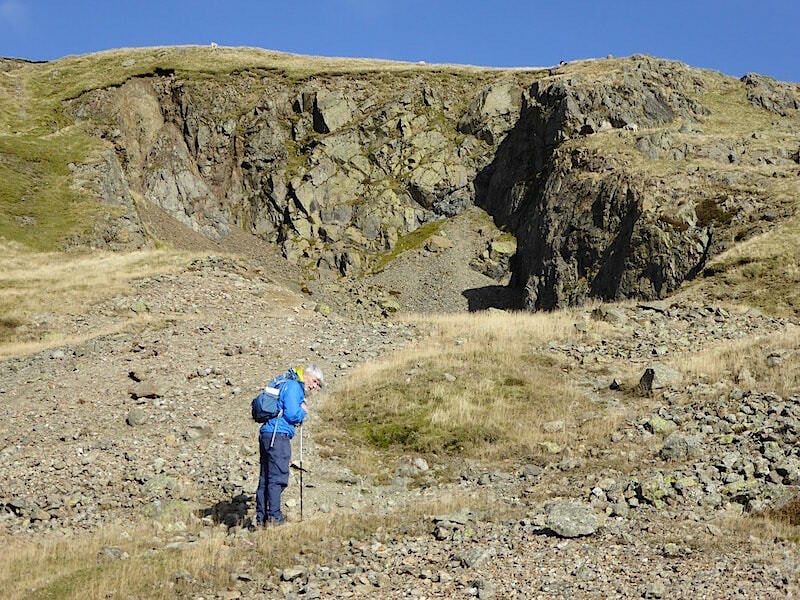 We decided to delay going straight across to the summit and first go over towards Green Side and explore the area around the enormous holes in the fell side which can be seen in the previous shot. As we walked across the two young women came towards us and continued on towards the bridge. 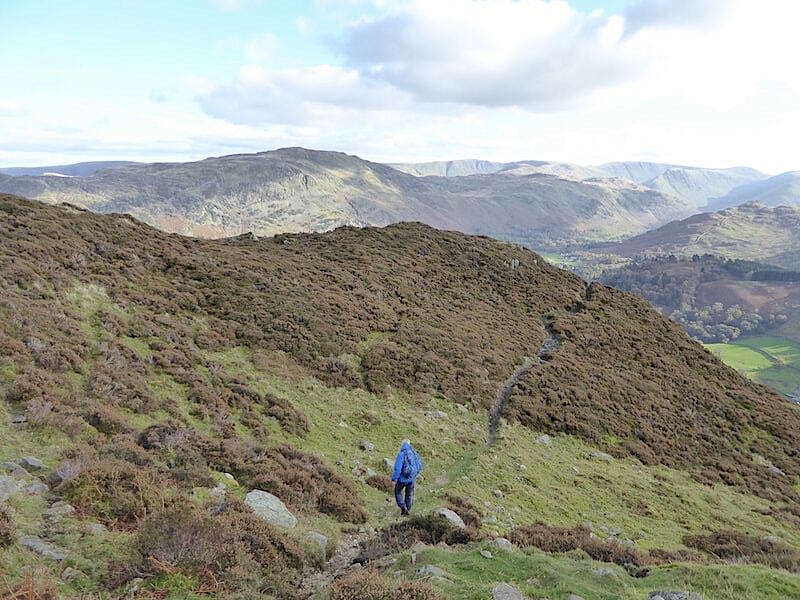 We just assumed they were making their way back down to Glenridding having been over to Sheffield Pike and continued on our way over to the fell side craters. We threaded our way between the sprawl of rounded grassy spoil heaps and arrived at the rim of this depression. From a distance it seems as though there are only two such holes, i.e. 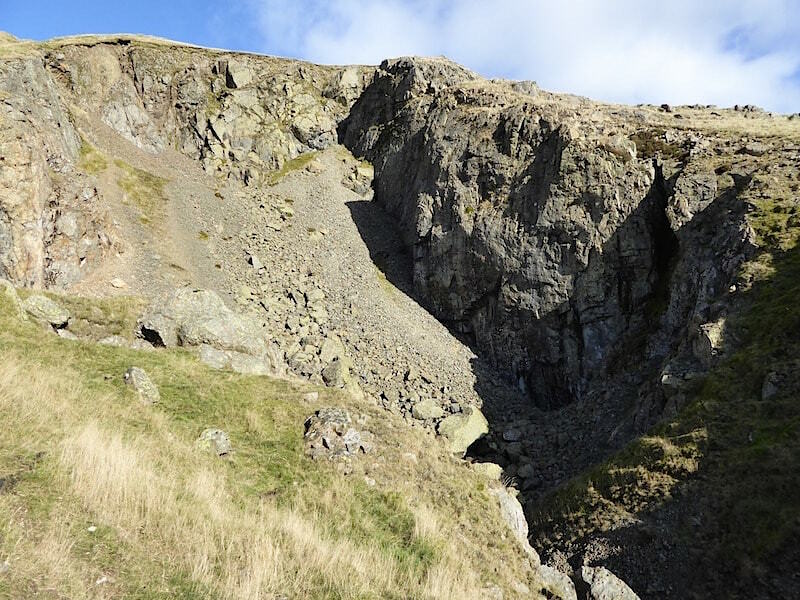 the uppermost two in the shot, but this one is hidden from view by a largish spoil heap. These huge holes were created when the fell side caved in, sometime in the 1800’s I think. 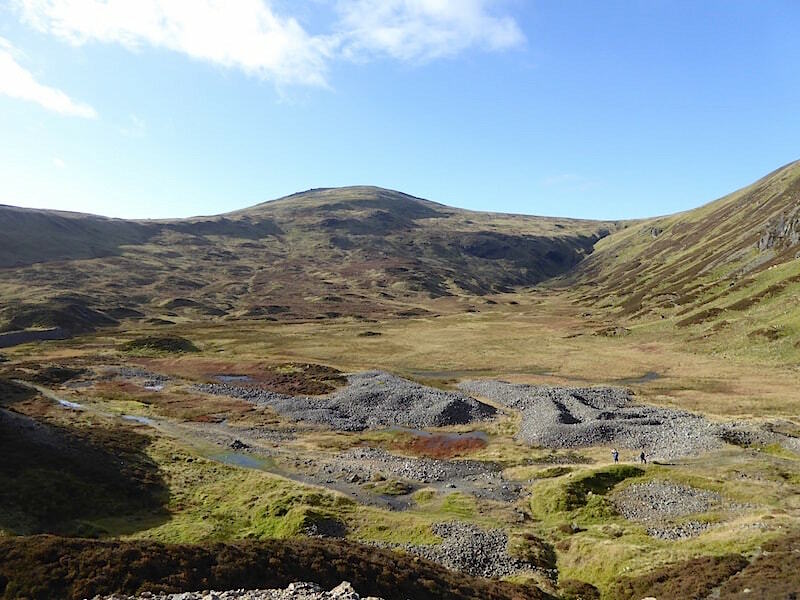 The mining areas, which had been dug deep into the fell side, had been unsupported and this resulted in the eventual disastrous collapse. We’re standing on the rim of the first crater peering down into it with our shadows falling on the far side of it. A plucky little tree has managed to gain a foothold amongst all the debris. 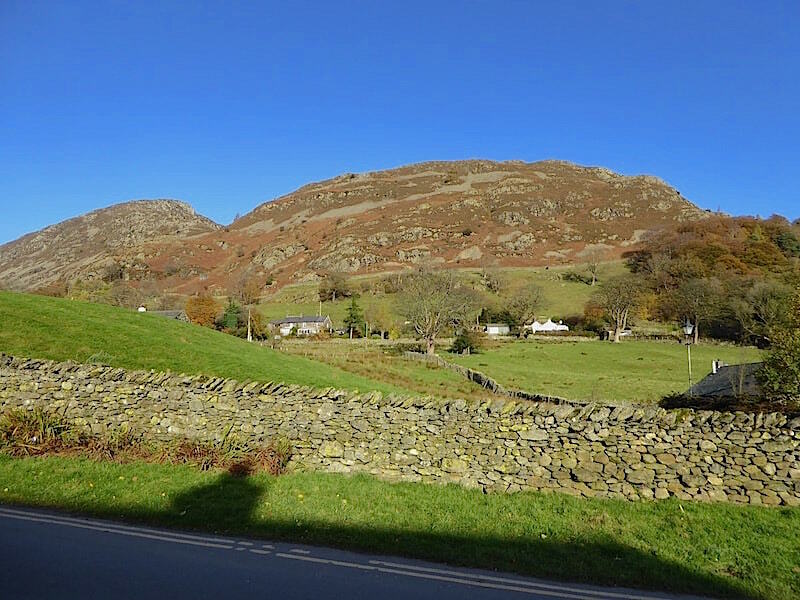 While we were making our way over we were aware of voices somewhere around but thought nothing of it, but as we were standing here who should turn up right behind us but the two young women who had come down off Sheffield Pike a little while earlier and who we thought were on their way back to Glenridding. When they turned up behind us and came to this abrupt halt one of them said, somewhat despairingly I thought, “Oh god, now what?” Her mate had a map and a gps both of which were looked at, or to be more precise were waved around rather forlornly. 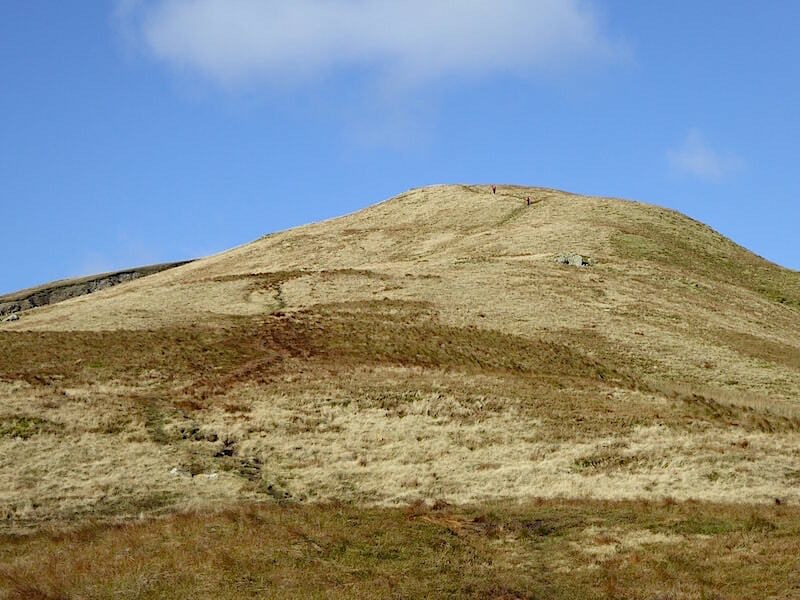 I asked them where they were heading to which the reply was Stybarrow Dodd, adding that they had just been on Sheffield Pike which we already knew having seen them coming down it. I pointed to the top of what you can see in the shot and told them they needed to be up there. 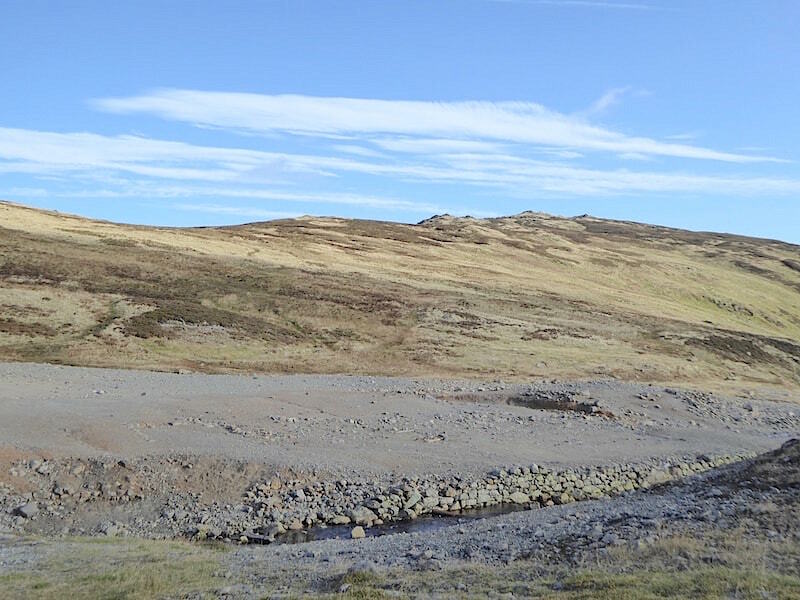 All they needed to do when they reached the bottom of Sheffield Pike was to continue up Green Side which would have been immediately opposite them, and from there over to Stybarrow Dodd. Faces fell in a mix of disappointment and frustration. We gave them directions as to how to get back on track and off they went. 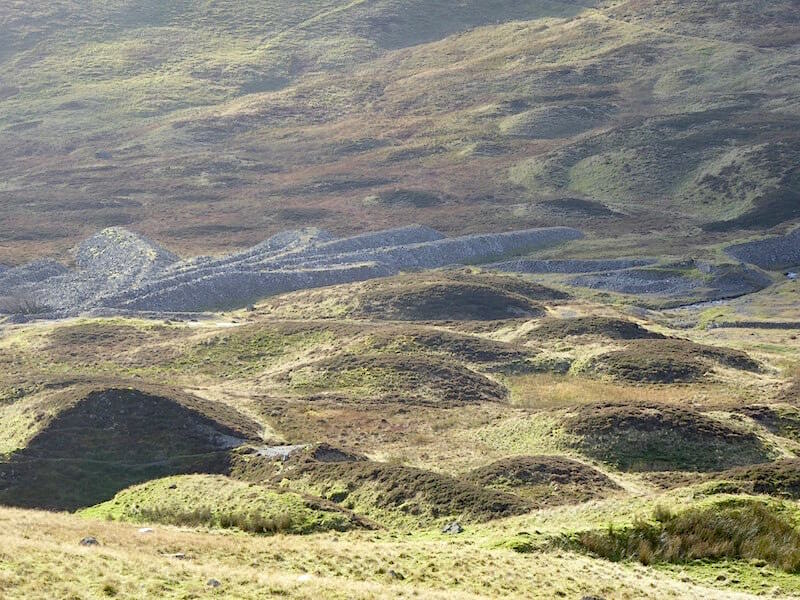 We begin making our way up to the next collapse and below us is the sprawl of spoil heaps with a couple of walkers threading their way through them as they follow the Sticks Pass path. 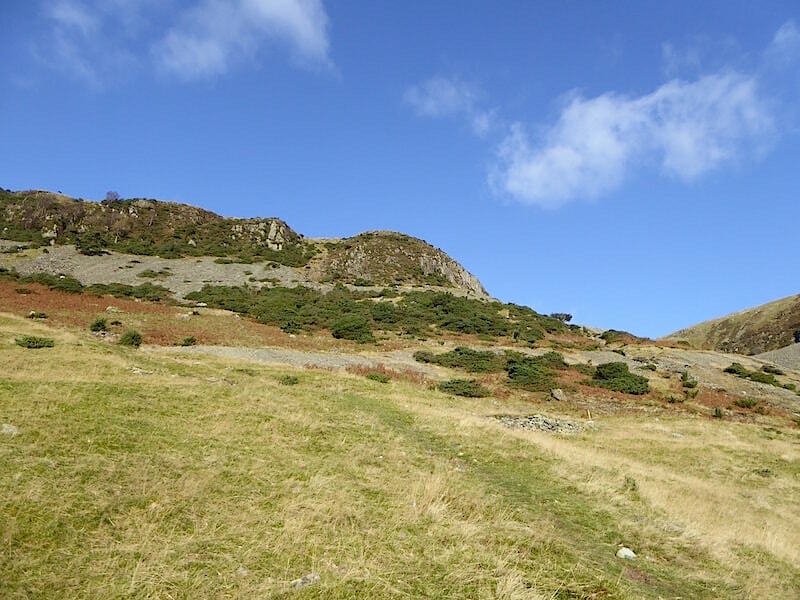 Over yonder is Raise and the long sweep down to the right from the summit will eventually meet up with the path the two walkers are on at Sticks Pass. 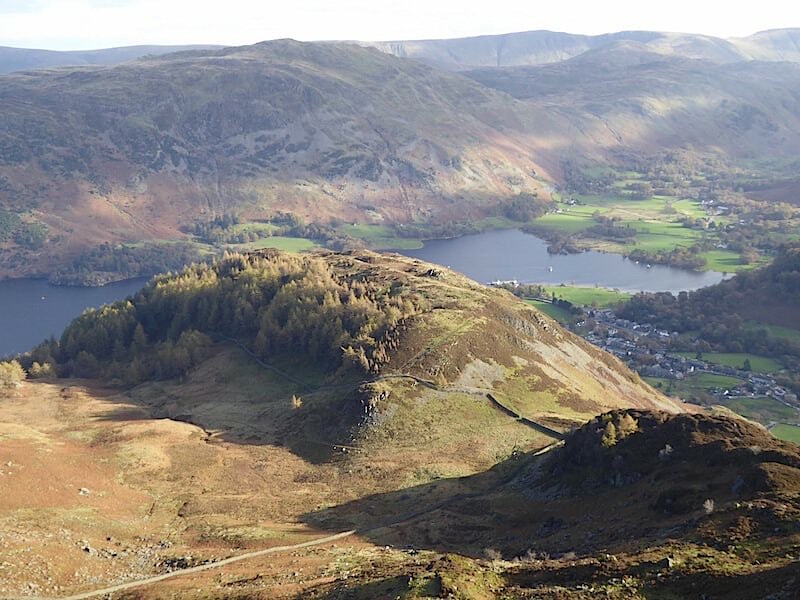 A closer look at Raise where, if you zoom in to the deep shadows just below the skyline, you might be able to pick out the ski hut belonging to the Lake District Ski Club. 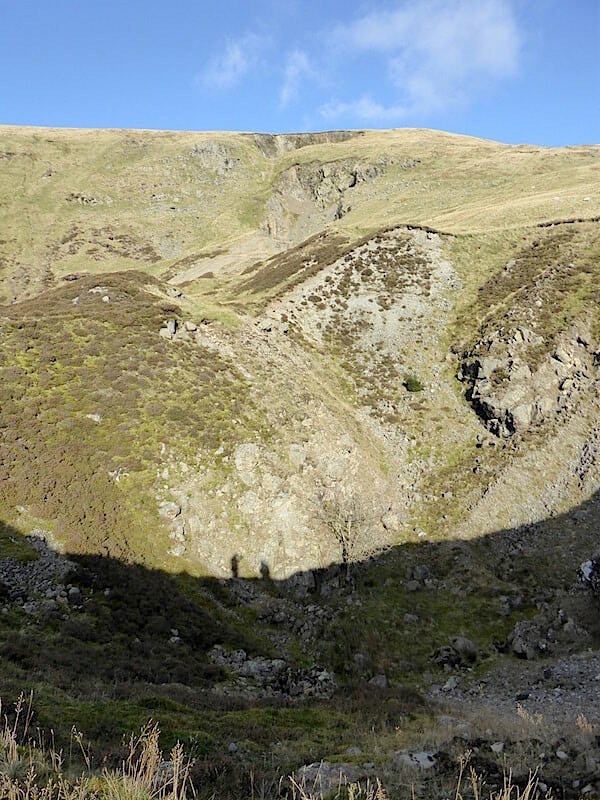 A little below and further to the right of it is a small shaded area, a small hollow in the fell side. I’m 99% certain that is what we saw a lone walker suddenly disappear into when we were up here in January 2016. The snow would have drifted into it and created what would have just looked like a continuation of the downward slope. He would have been completely unaware of the hollow as he walked along and it must have been an enormous shock to suddenly find himself disappearing completely down into the snow. He would have had no idea what he’d dropped into or how far down he would go. It was a few minutes before he surfaced again just at the point when we were about to call out the MRT. He carried on walking down but it must have been on very shaky legs for a while. 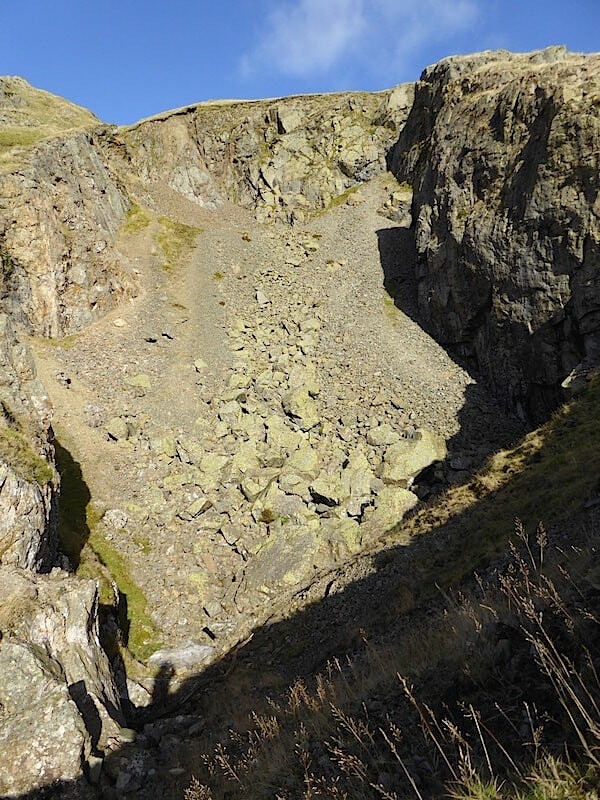 Just below the white rocks in the centre of the shot are the two walkers in the shot before last steadily making their way along the path on the lower slopes of Green Side. Meanwhile, we are still exploring the collapse zone and approaching the middle one of the three …..
….. which is considerably larger and deeper than the previous one we peered into. I tried to imagine the tumultuous rumbling that must have accompanied the collapse. As far as I’ve been able to discover no-one was working in the mines below at the time. The path up to the very top crater which we didn’t carry on up to on the basis that one collapsed crater in a fell side is pretty much like all the others even if it was bigger and deeper. This one was impressive enough to be going on with and there’s my tiny shadow at the bottom of it as I try to fit the whole thing into the viewfinder. 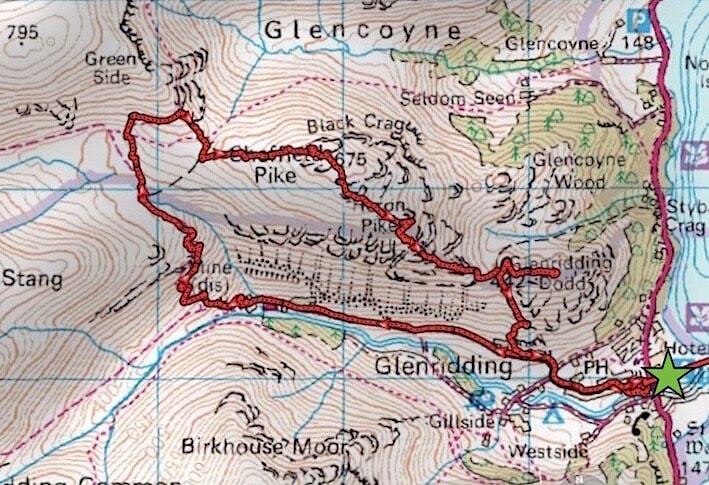 We make our way across Green Side to pick up the Sheffield Pike path. 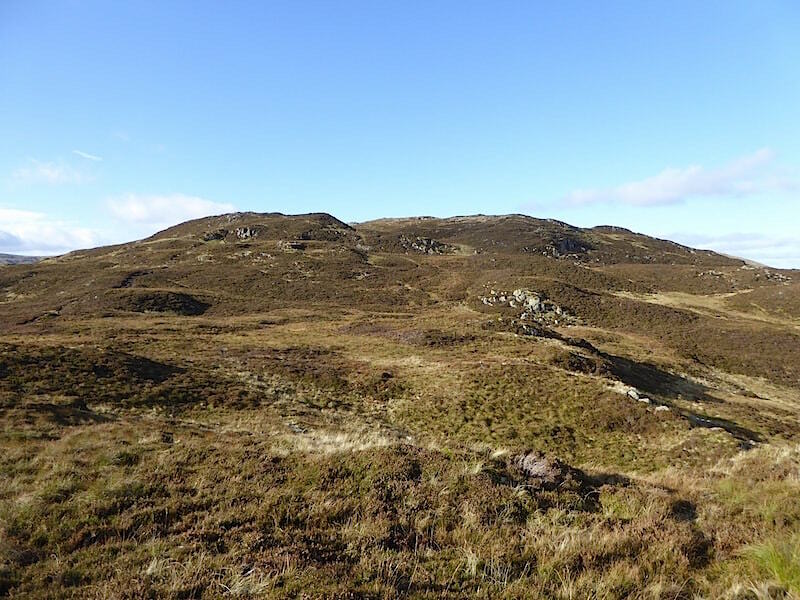 Below us are the grassy rounded humps of old spoil heaps and the relatively newer stony heaps beyond, the spokes of which seem to be clawing at the lower slopes of Raise like the talons of a gigantic raptor. 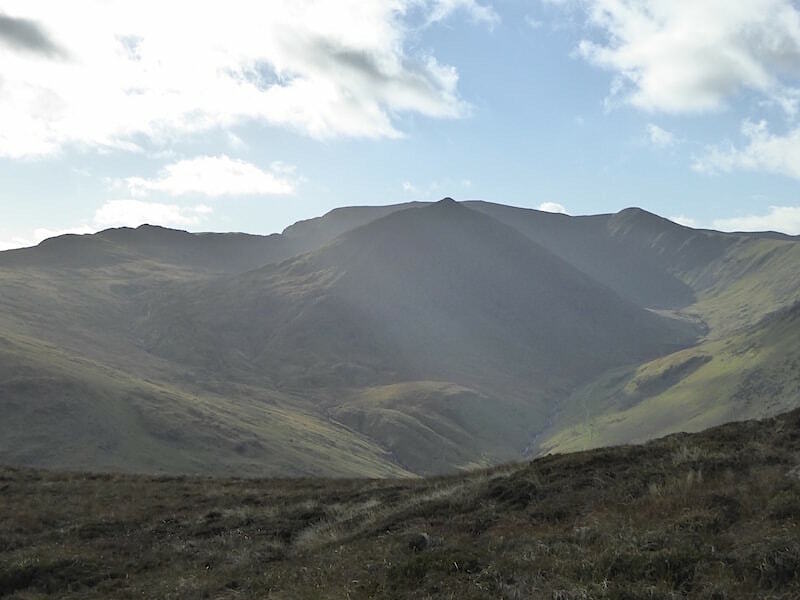 Over on the left skyline is the Striding Edge route, followed by Catstycam, beyond that is Helvellyn and its long sweep down to Helvellyn Lower Man. Its great to have the sunshine back once more but photos to the south from Green Side and Sheffield Pike suffer in consequence. 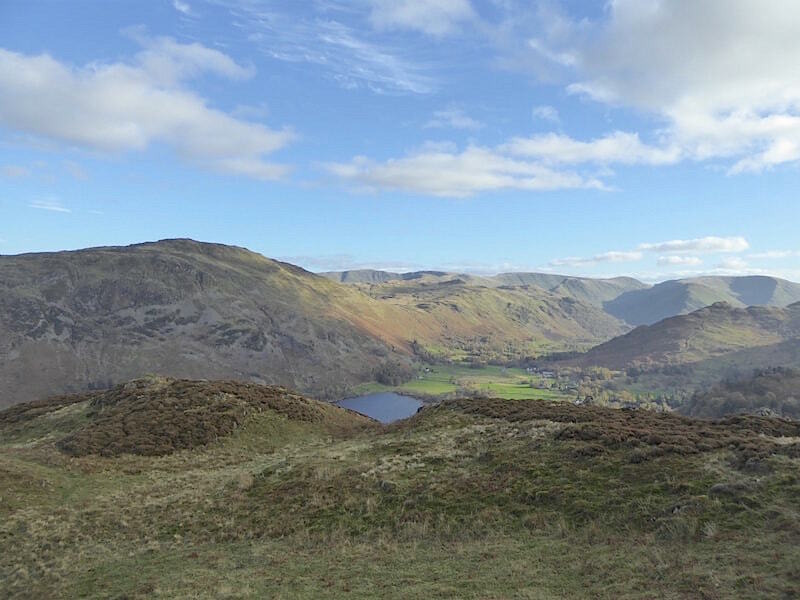 We emerge onto the lower slopes of Green Side and have a grand view of Sheffield Pike with Ullswater and its surrounding fells beyond. Our jackets went back on while we were exploring the holes as we were starting to get the occasional hit from the very chilly north easterly, up here it was much more full on and coming straight at us. Eyes and noses began getting some running practice in. 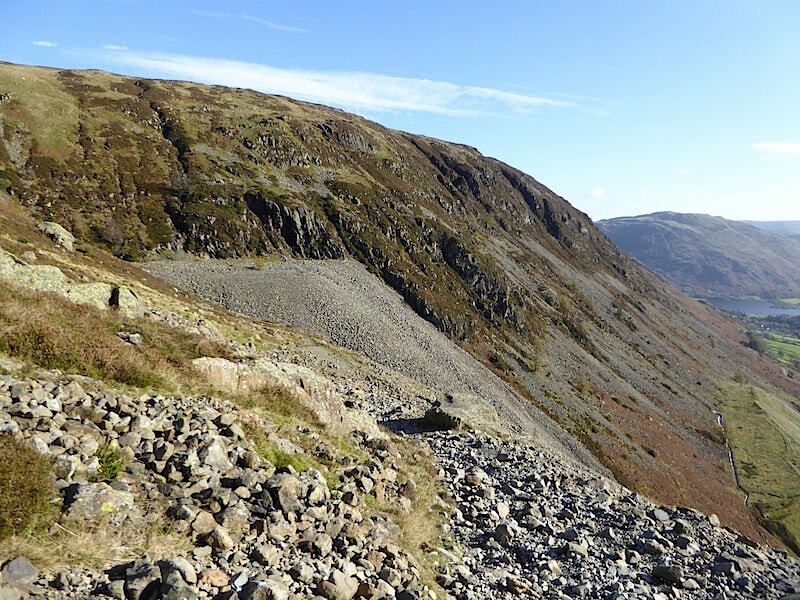 Down to Nick Head, the col between Sheffield Pike and Green Side, and a look back before we start up Sheffield Pike. 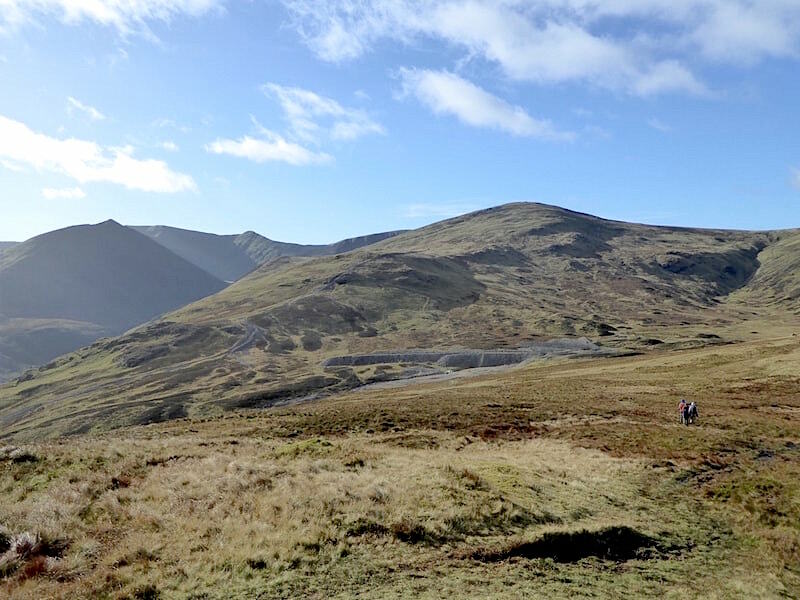 Up ahead are the two young lasses, now also wearing another layer each, who at last are on their way to Stybarrow Dodd. Why they turned down to the left instead of going straight on up here is a mystery, especially as one of them had a map and a gps. 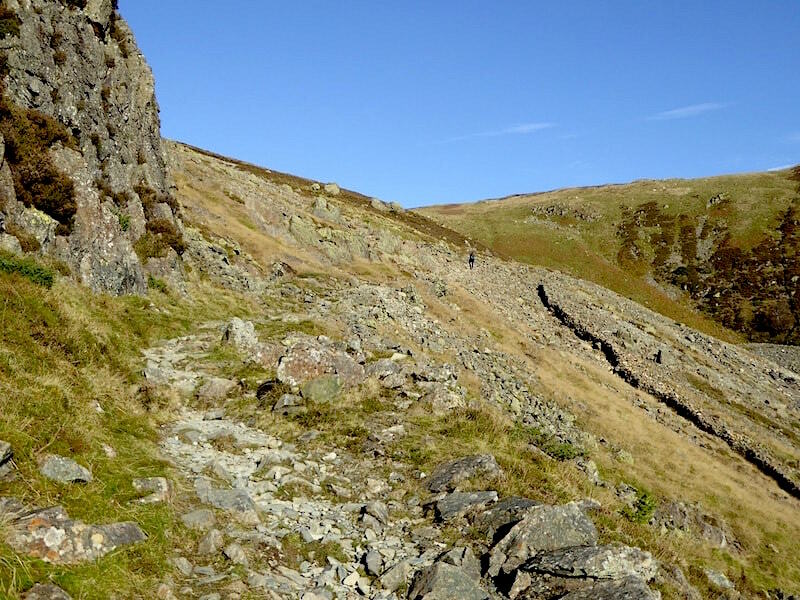 On the climb to Sheffield Pike and a look back at Green Side with Hart Side over to the right of it. The iron post is inscribed M 1912 with H 1912 on the other side, M for Marshall, H for Howard. A family group came by as I was taking this and the little lad bounded over to see what this was. He read the inscription out loud and I told him what the M and H stood for and he bounded back to Mum and Dad with the information. Dad then asked him how long the post had been standing there. Hmm, a bit of a think, a bit of finger movement and eventually out came the correct answer. Big sister looking unimpressed, as only big sisters can. There goes the little family group, the little lad probably thrilled because he got the right answer, and something unusual to tell the teacher when he’s back at school on Monday. Well done to Dad too for making a game of it rather than simply telling him the answer. 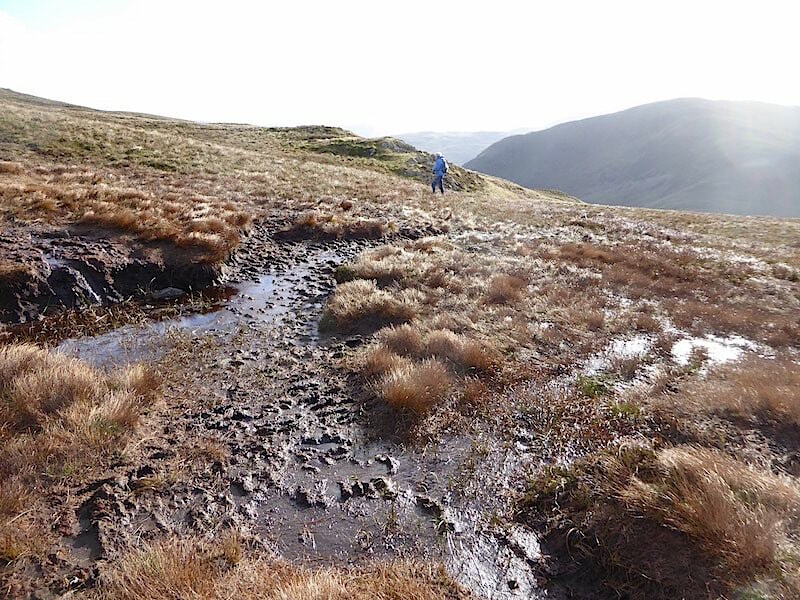 The summit of Sheffield Pike is up ahead …..
….. but there’s a whole heap of obstacles, in the form of peat hags and bogs, to negotiate before we get there. Quite a few of them were extensive so a lot of detouring around them was inevitable. 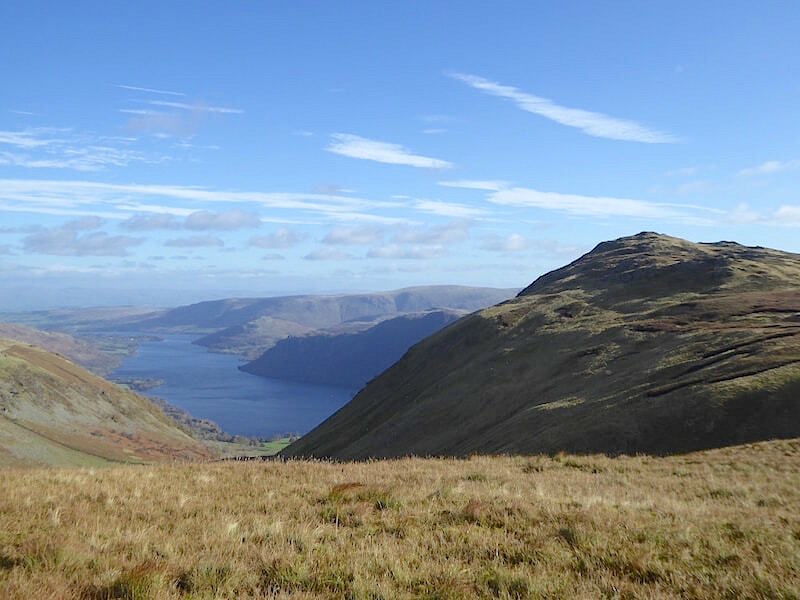 A quick peep down into Glencoyne as we walk over to the summit cairn. 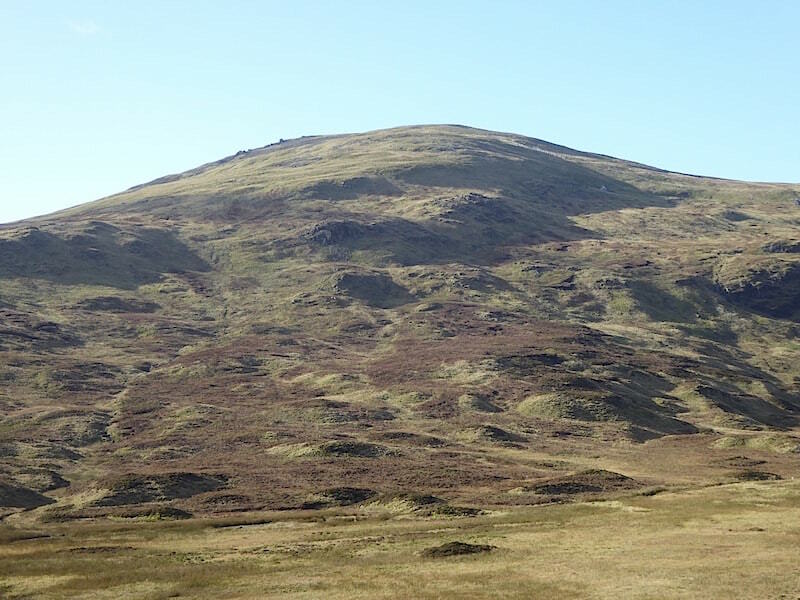 Stybarrow Dodd is now in view over on the left and the two young women will be well on their way to it by now. I’ll bet the wind chill was interesting across there, it was bad enough over here. 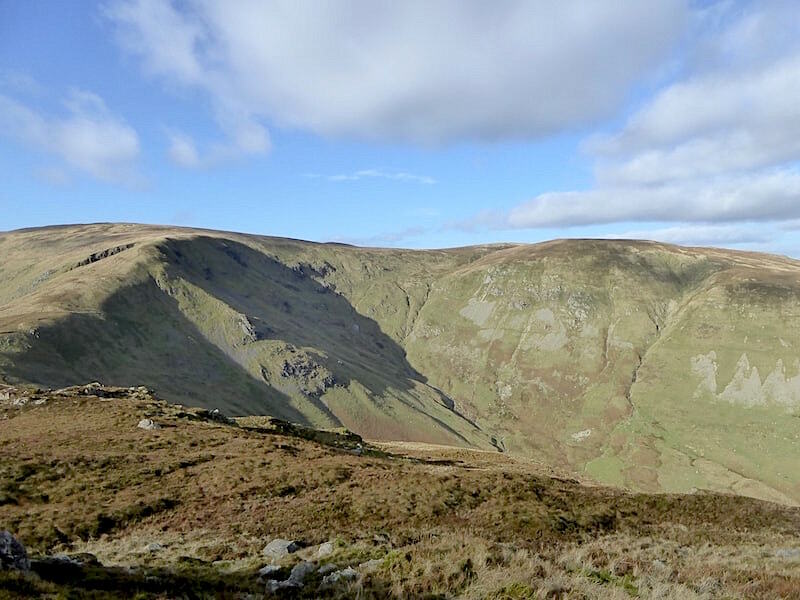 On the left skyline the long sweep between Stybarrow Dodd and Raise with the darker gully between the two marking the route of the Sticks Pass path. 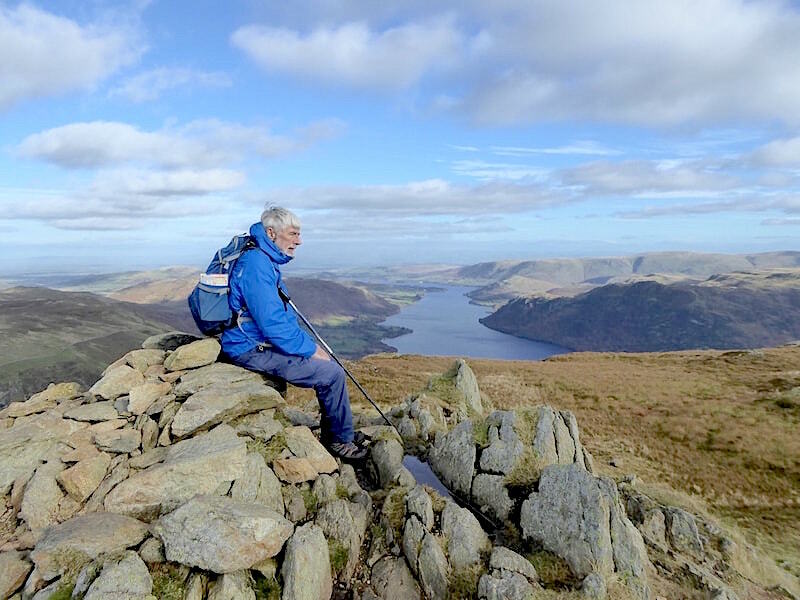 Never mind the wind chill just admire the terrific view from Sheffield Pike summit. 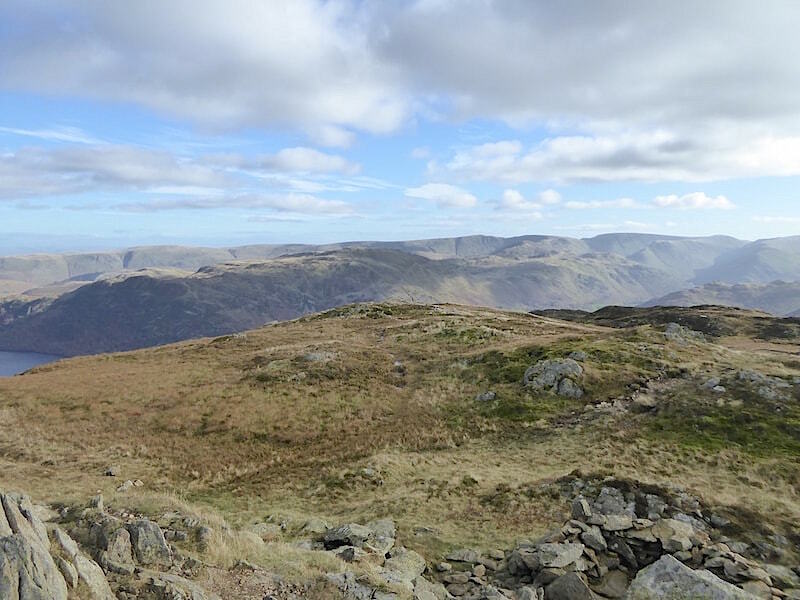 A panorama of fells to the east from the summit …..
….. and to the south. Meanwhile I’m huddled into every piece of clothing I have with me as I stand in the blast chiller for a moment or three. 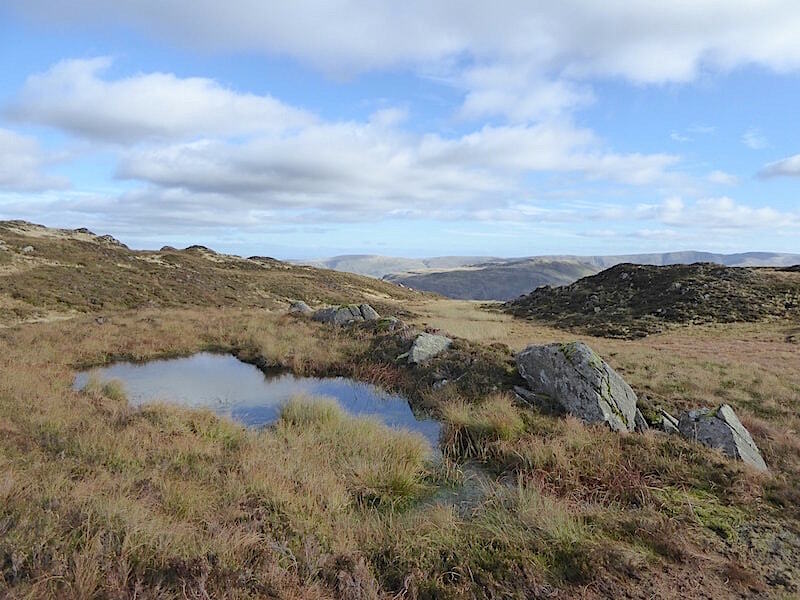 Now chilled to the bone after hanging about on the summit for a good while we set off across the swampy morass of the summit area …..
….. where there’s an abundance of puddles, pools and outcrops to wend your way around. 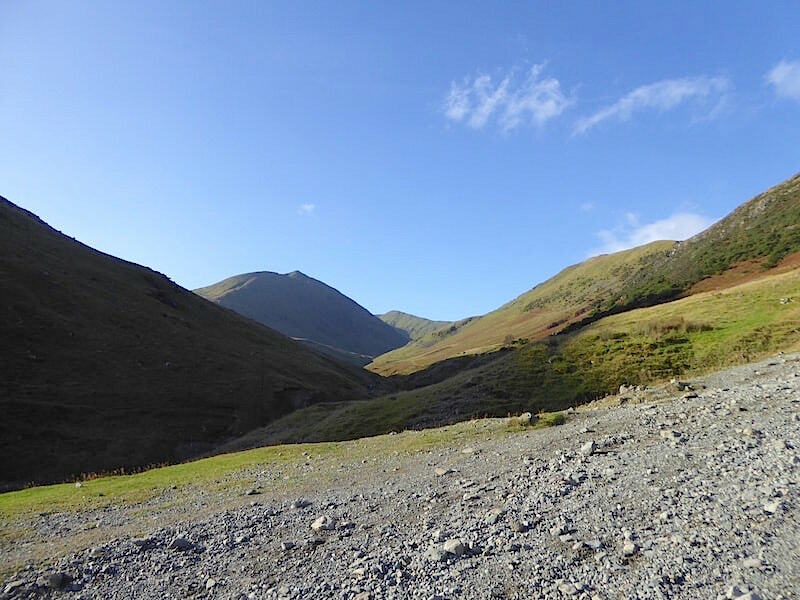 Not the best or the clearest of shots but nevertheless looking over at Catstycam standing sentinel before Helvellyn’s massive bulk is an impressive sight. 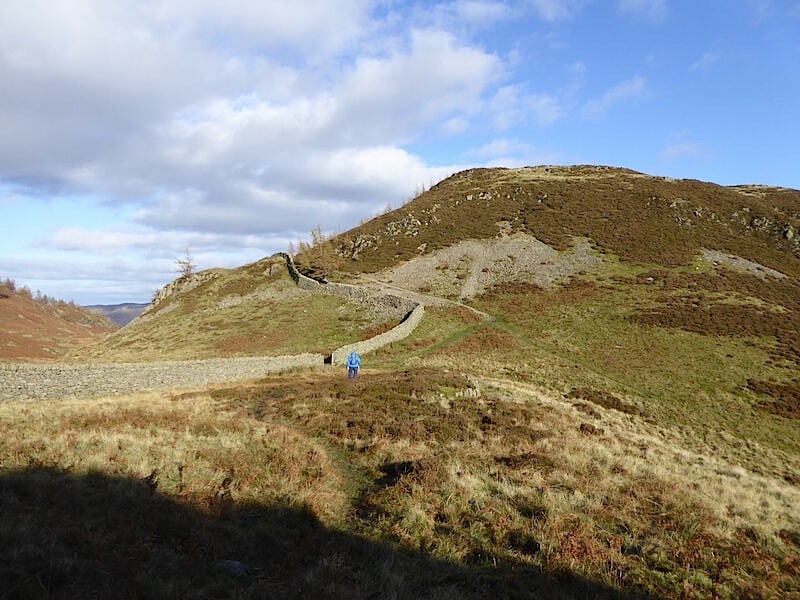 Yomping down through the narrow heathery path to Heron Pike …..
….. from where the view is quite stunning, especially on such a lovely day. 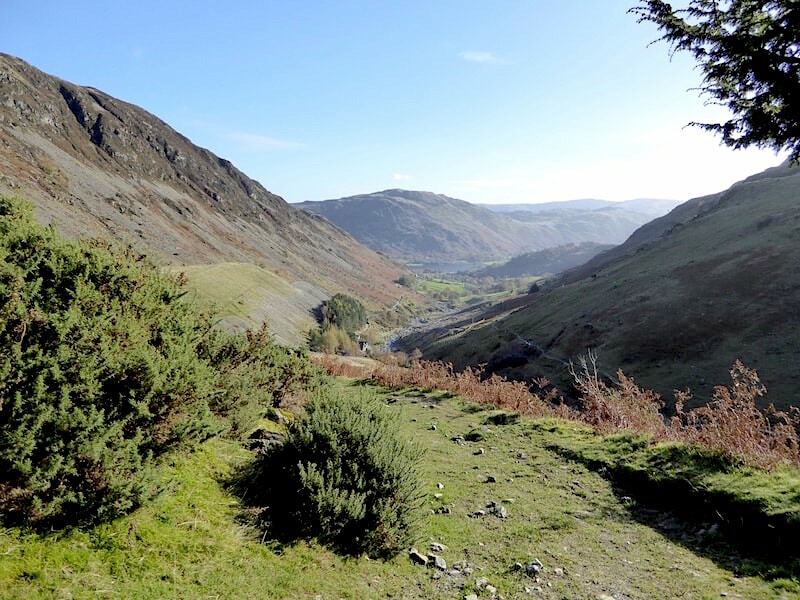 A good way below us is Glenridding Dodd which will be our next port of call. From Heron Pike the view behind us is not quite so stunning and AW considered it to be a ‘dismal, cheerless place’ even on a sunny day. In today’s sunny weather it doesn’t look too bad though. 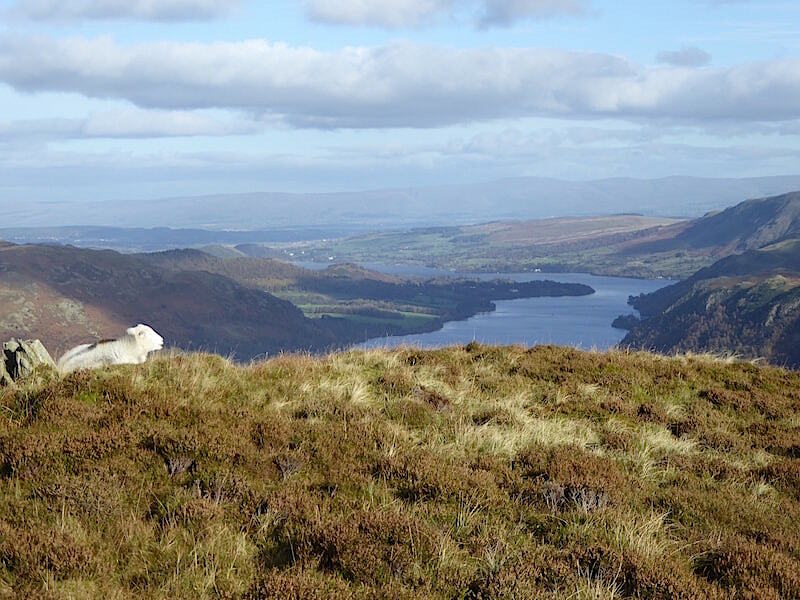 From Heron Pike we follow the steep and rough path down the south east ridge so its time to put the camera away and concentrate on where I’m putting my feet …..
….. but before that I caught sight of this Herdwick ewe sitting in the sunshine high above Ullswater chewing the cud and enjoying a bit of peace and quiet. 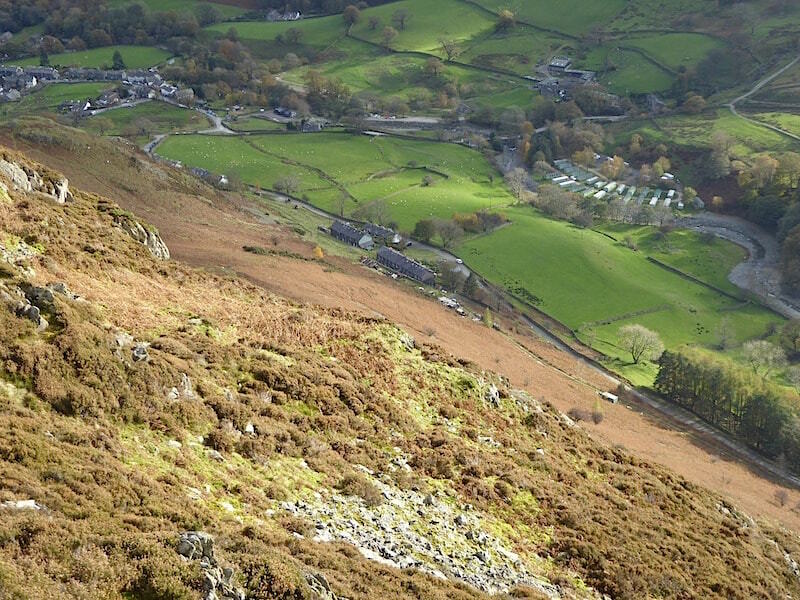 A less exposed section where the camera came out again …..
….. and further along a dizzying view down to Rake Cottages and the Gillside Farm caravan and camping site. 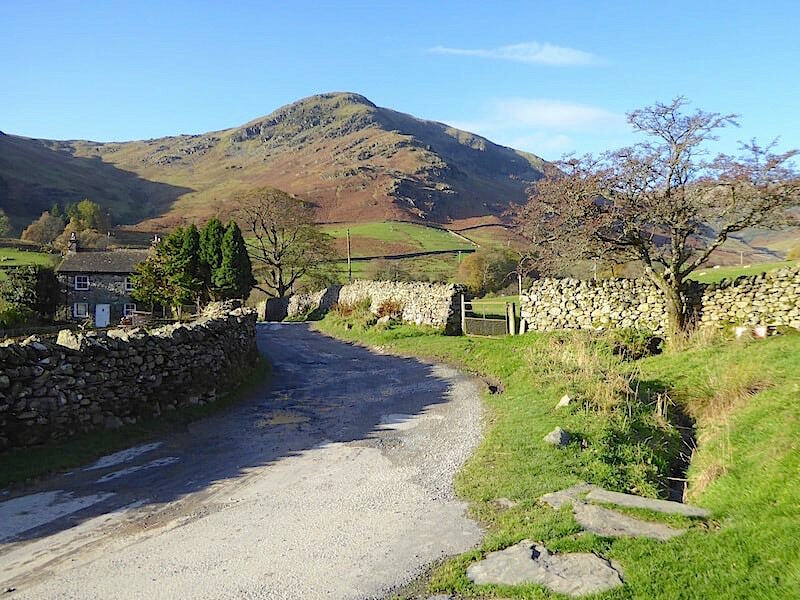 The road in front of Rake Cottages is the one we walked up this morning, a route up to Sheffield Pike described by AW as ‘not at all exhilarating’. Well that may be so but there’s no shortage of exhilaration descending the south east ridge, that’s for sure. 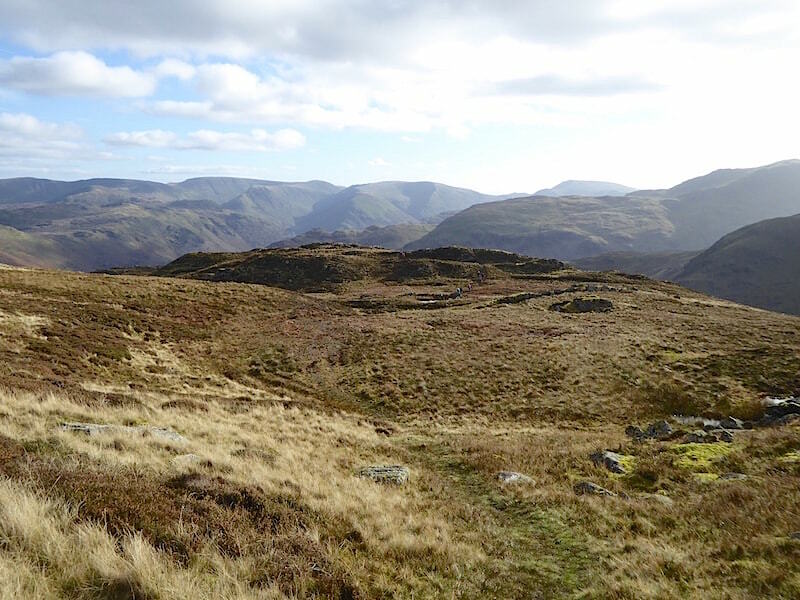 A look back at Heron Pike from the descent. It doesn’t look like it but there is a path through there, honest. 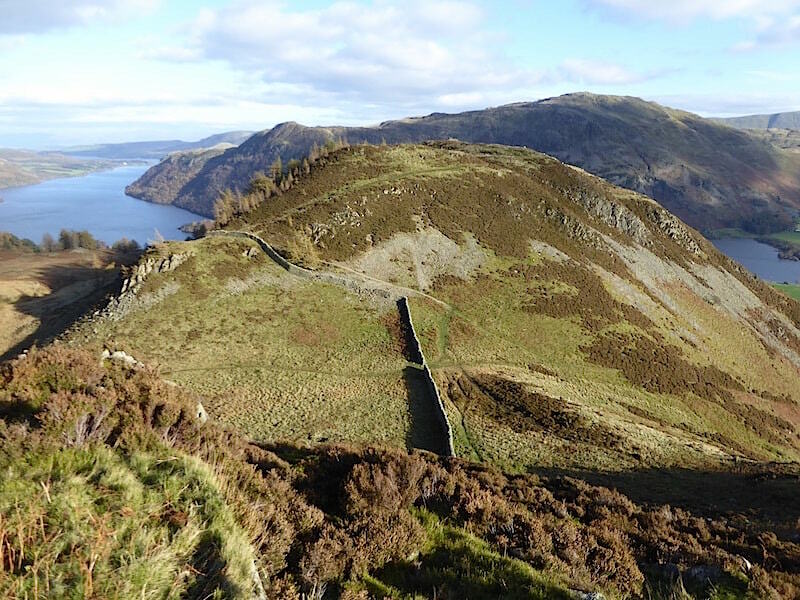 Another dizzying view, this time down to Glenridding Dodd where we are making for the junction of paths by the gap in the wall. 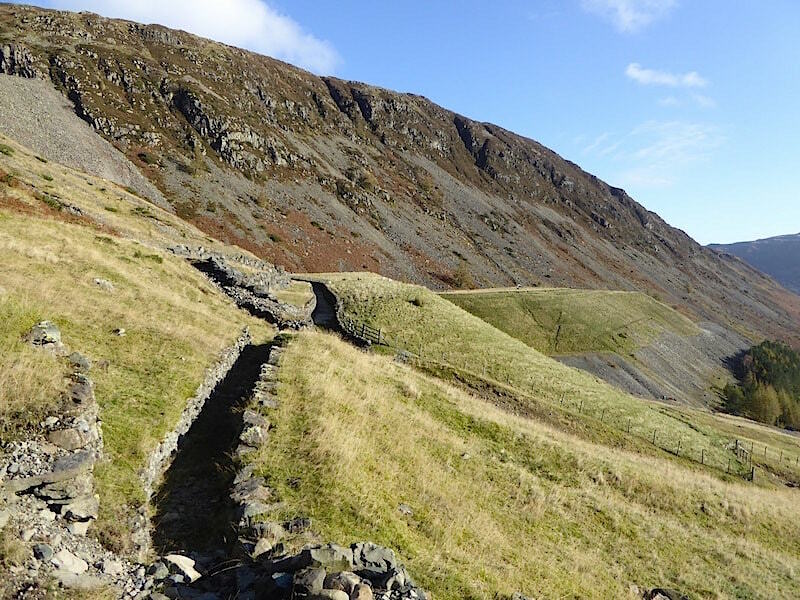 At that point the path we’ll follow is the grassy one on the right of the wall up to the stony one which is going over to the left. Just above the tree, where the wall levels out a little, its a right turn onto another grassy path and up to the summit …..
….. and here we are safely back on terra firma at the little grassy col …..
….. where the jackets are taken off again, thirsts are quenched once more and we take a couple of minutes to give the legs a chance to recover. 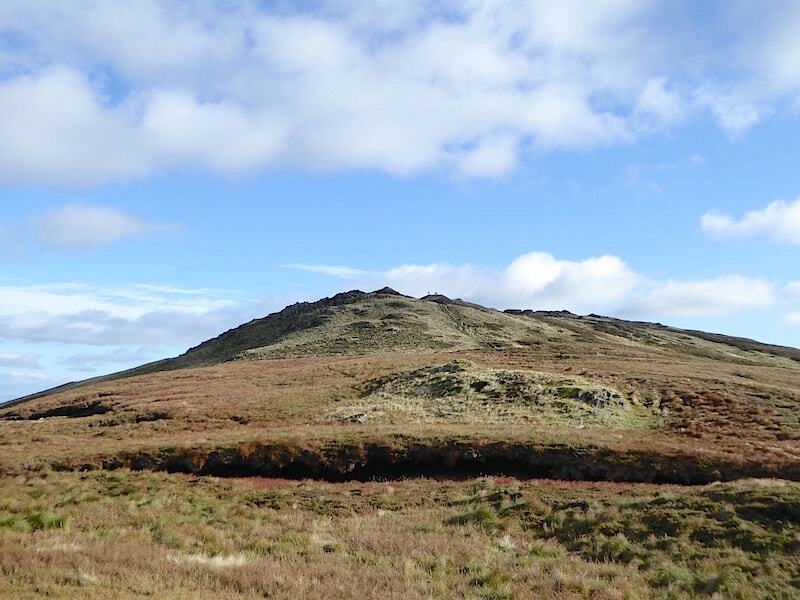 Heron Pike is on view but the summit of Sheffield Pike is now out of sight as it is set much further back. 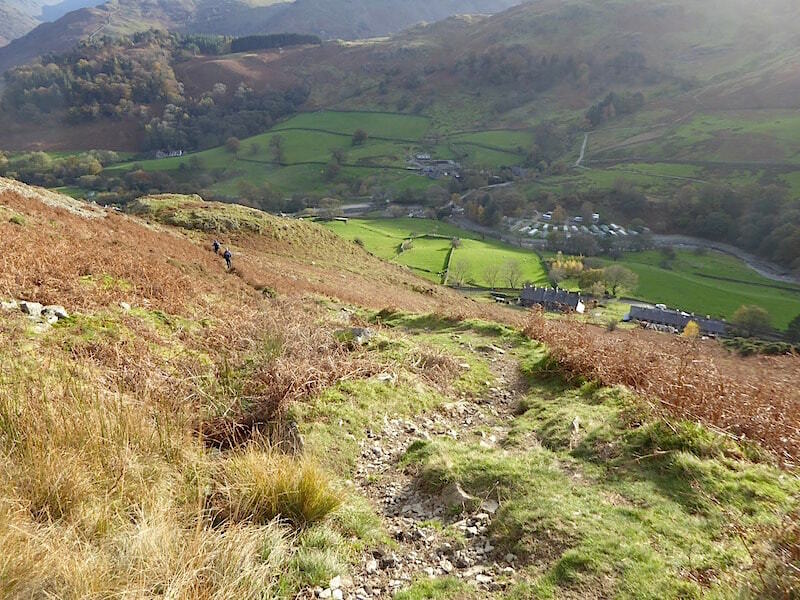 A very short uphill climb brings us out onto the top of Glenridding Dodd. A walker was sitting by the summit cairn having a bite to eat so we went beyond it and did a bit of exploring. We’re temporarily under some cloud so our surroundings look a little on the gloomy side. Its not the only thing on the gloomy side at present, the other team member has just suffered an unwanted slither on a sloping patch of muddy grass and now has mud, and lord knows what else, down his right hand side from shoulder to ankle. No injuries were sustained but there’s a severe case of wounded pride which is borderline terminal at the moment. 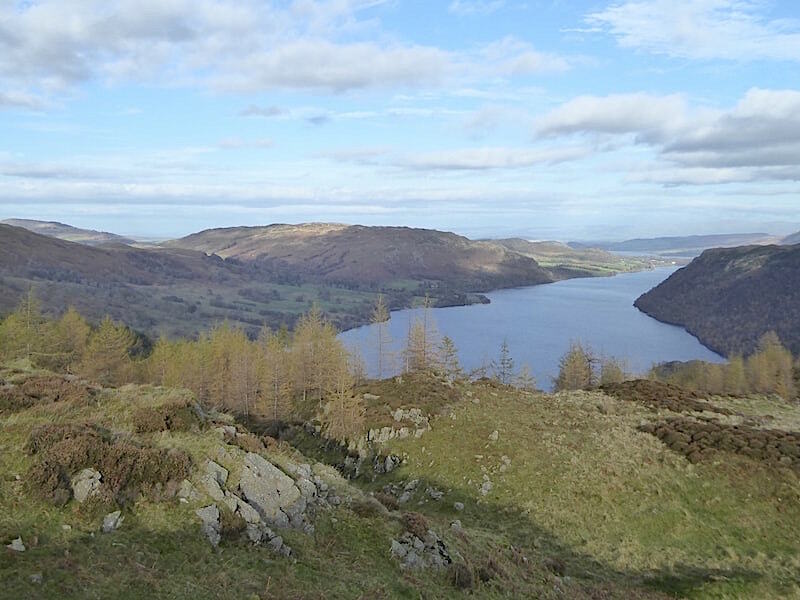 Another lovely view along Ullswater with Gowbarrow Fell on the left hand shore. Behind me what dry grass is available is being put to good use in several attempts to remove mud from trouser leg and jumper sleeve, all in stony and exasperated silence. 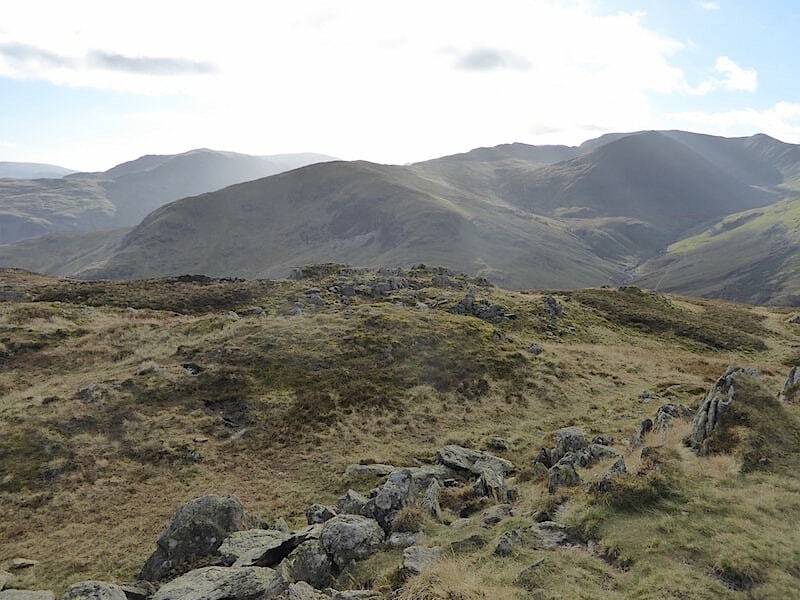 Having explored the area beyond the summit we begin making our way back to it, its that low rocky hump skulking below Heron Pike and Sheffield Pike, and they are flanked by Raise on the left and Hart Side on the right. 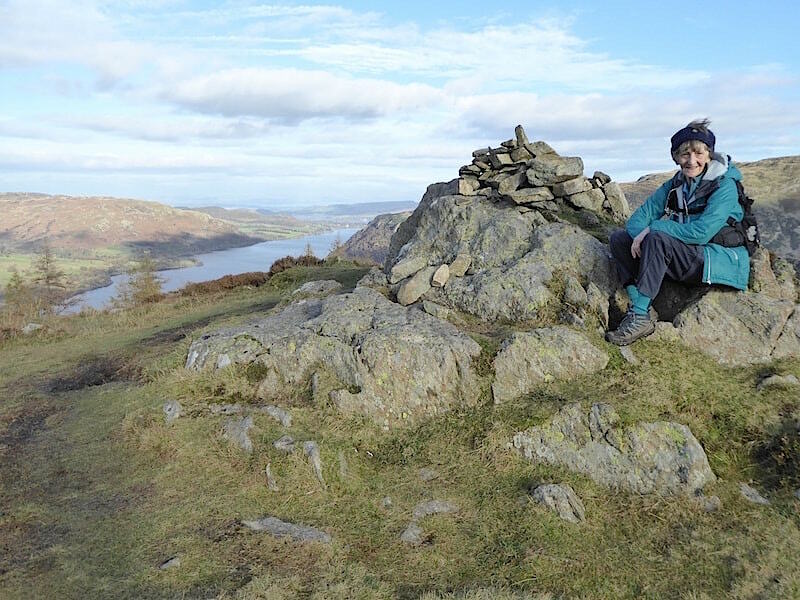 We’re not quite back in good humour just yet but at least the trousers and jumper are drying out …..
….. and I take my turn to keep company with Glenridding Dodd’s summit cairn. 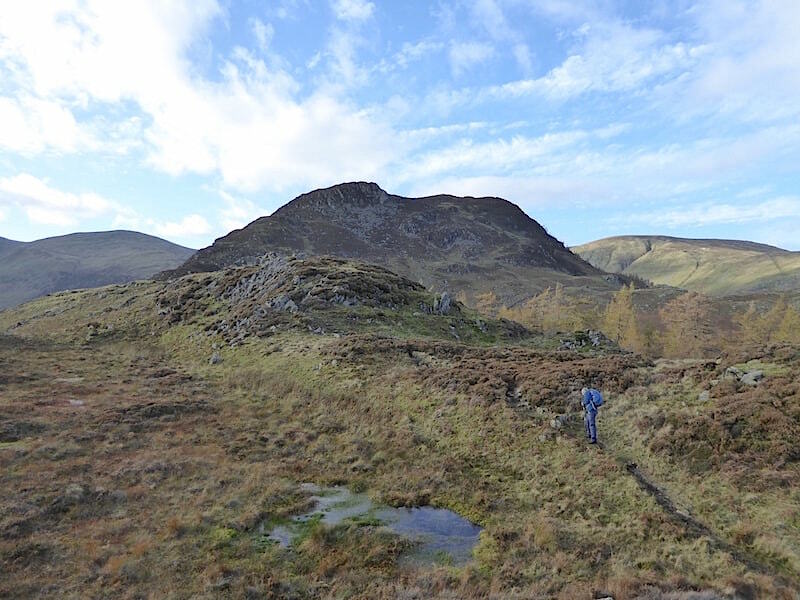 We take our leave of the summit via The Rake which is still littered with the debris washed down during Storm Desmond. 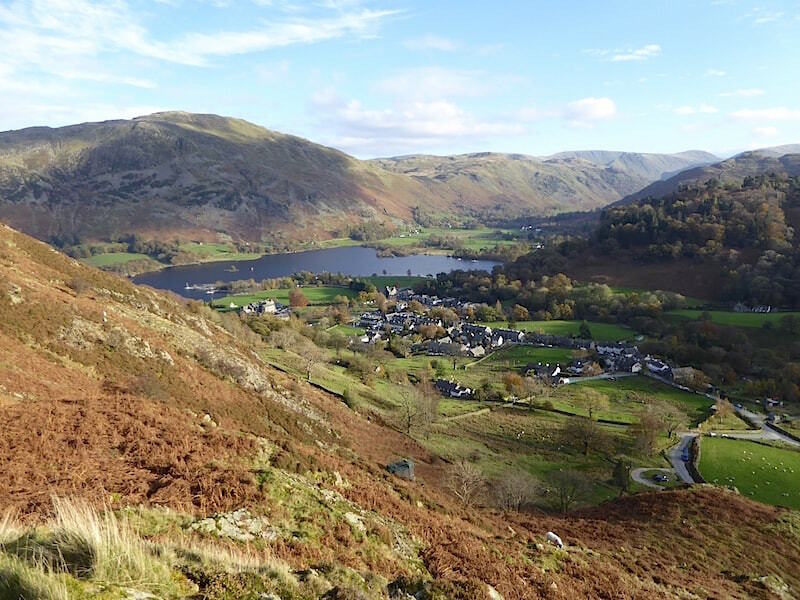 We take the short diversion on the left of the path to a viewpoint …..
….. overlooking Glenridding and Ullswater and its a very pleasant place to sit and just do nothing but enjoy the view for a couple of minutes …..
….. or even stretch out and simply gaze up at the beautiful skies. Breathe in ….. breathe out ….. and relax. I think we’d better get a move on before one of us nods off. 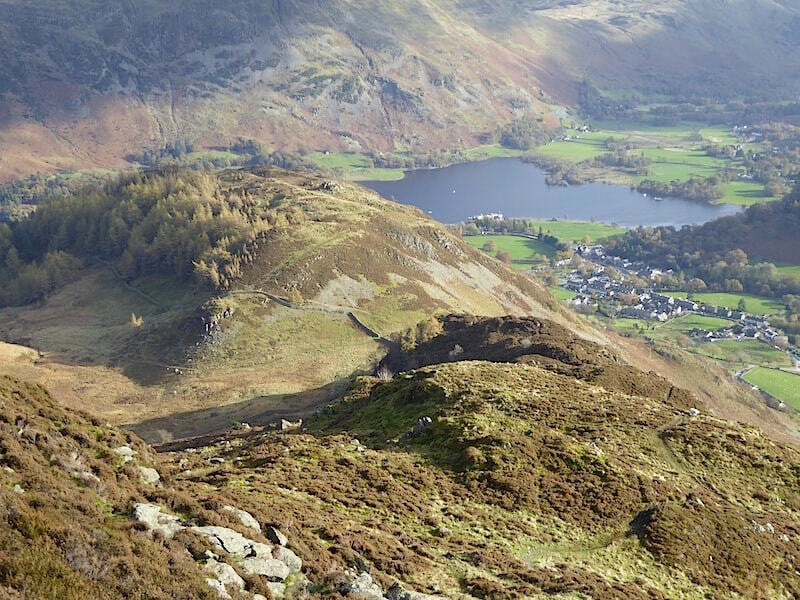 Back down in Glenridding where the bulk of Birkhouse Moor behind us is blocking out the sunlight and casting Glenridding into early gloom while Place Fell is still splendidly lit. Its not yet three o’clock but of course the clocks went back last night so we now have to get used to fewer hours of daylight and tailoring our walks accordingly. Let’s not think about that too much though, and we’ll just reflect on what a lovely day we’ve enjoyed, especially as its been such a long time since we had one as good as this. When we got back to the car the one belonging to the map reading tutor and his companion was still parked in front of us. 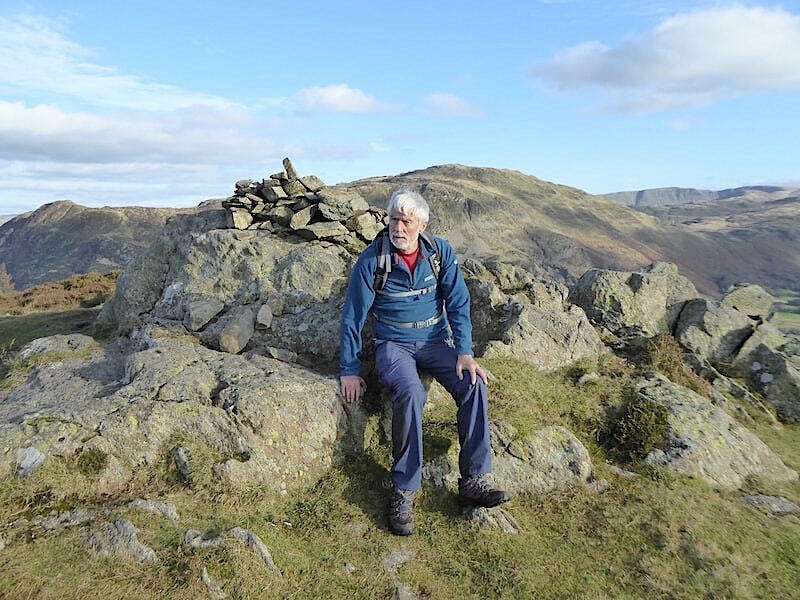 They can’t still be queueing on Striding Edge can they?